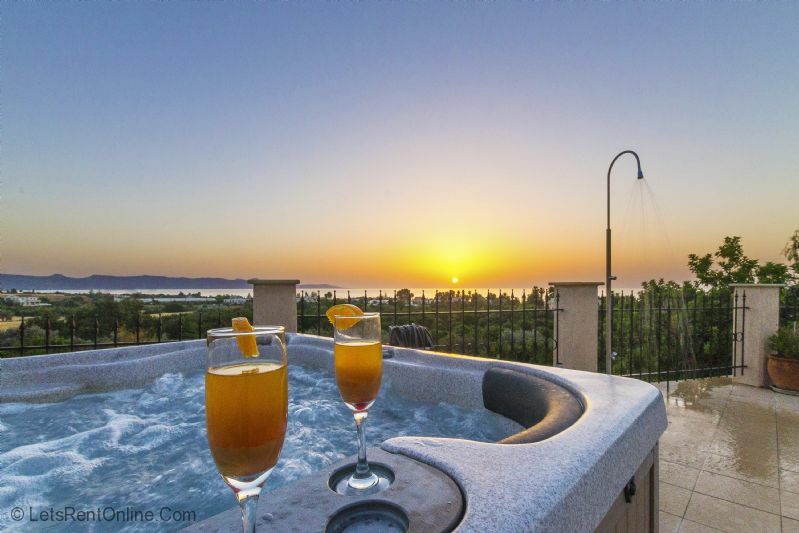 Welcome to ‘Villa Leni’, a stunning holiday home situated in a private elevated position overlooking the unspoilt coastline of Argaka Bay, Latchi and the Mediterranean Sea. 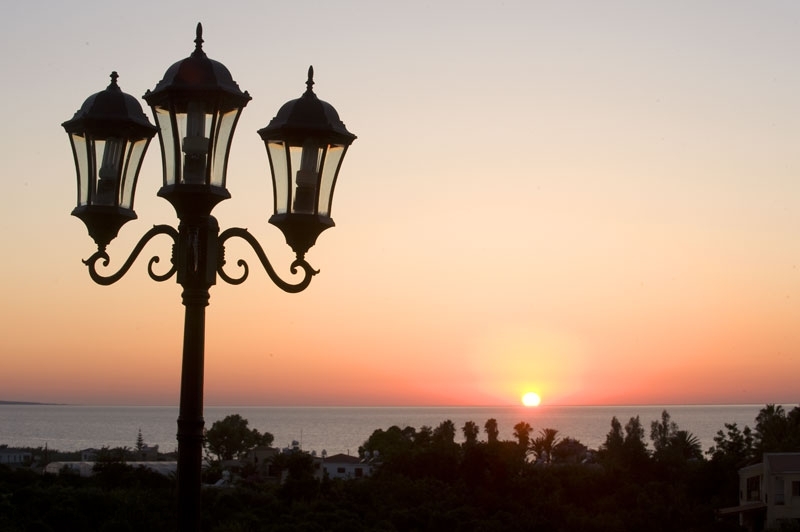 Argaka is a very affluent and tranquil location situated just outside the traditional yet vibrant town of Polis just North of Paphos. 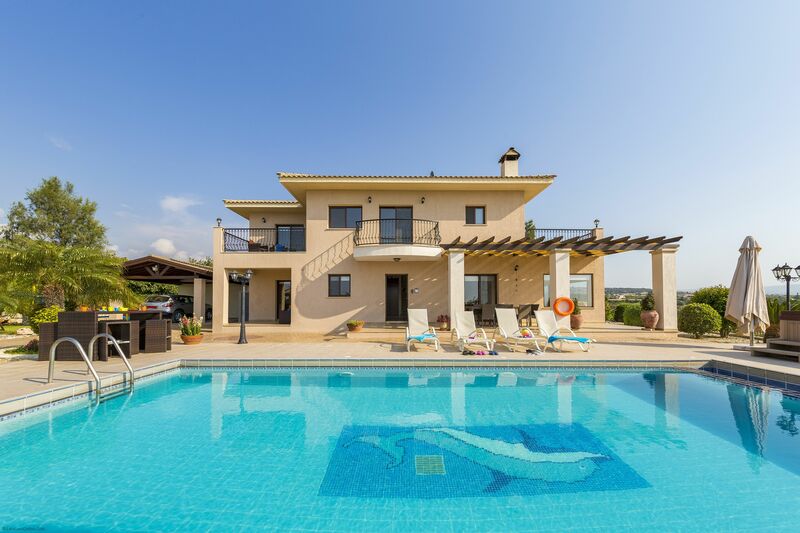 The impressive 4 bedroom, 3 Bathroom detached Cyprus Holiday which is ideal for couples seeking privacy, large families or other groups of friends, has been designed, furnished and landscaped to the highest standards and offers a real taste of traditional Cypriot village life. 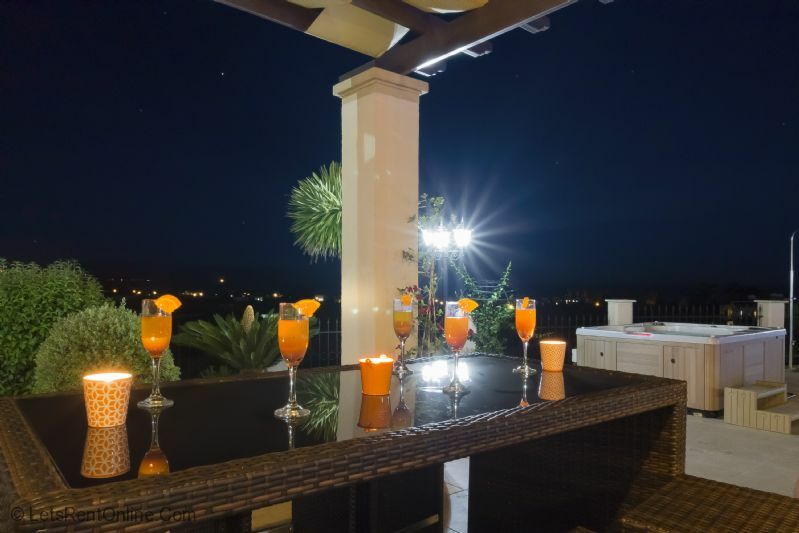 Enjoy relaxing on a sun lounger by the private pool (which can be heated), alfresco dining on the terrace (or bbq area), your favourite aperitif on one of the upstairs balconies (as the sun sets over the clear blue waters) or enjoy a Jacuzzi bath whilst watching the twinkling lights of Latchi Marina in the evening. Perhaps you will do each one every day! 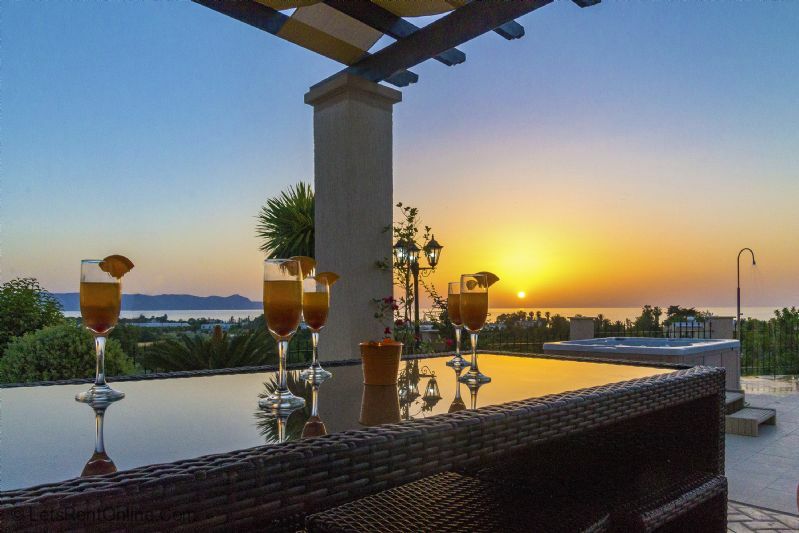 After leaving the coast road, the villa is easily accessed and it is possible to walk to the local amenities as desired. Several Tavernas as well as the beach itself forms part of a beautiful stretch of coastline going all the way to Latchi and the Akamas Nature Reserve in one direction and ‘Pomos’ (the last village in the South of Cyprus) in the other. 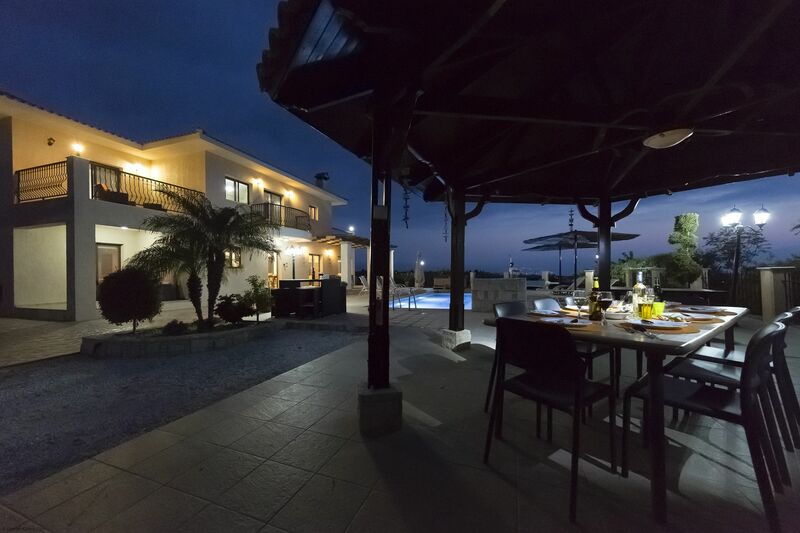 There is even an Irish Bar just 1km away which has Wi-Fi, entertainment, great food and drinks selection and overlooks the Sea from its verandah. 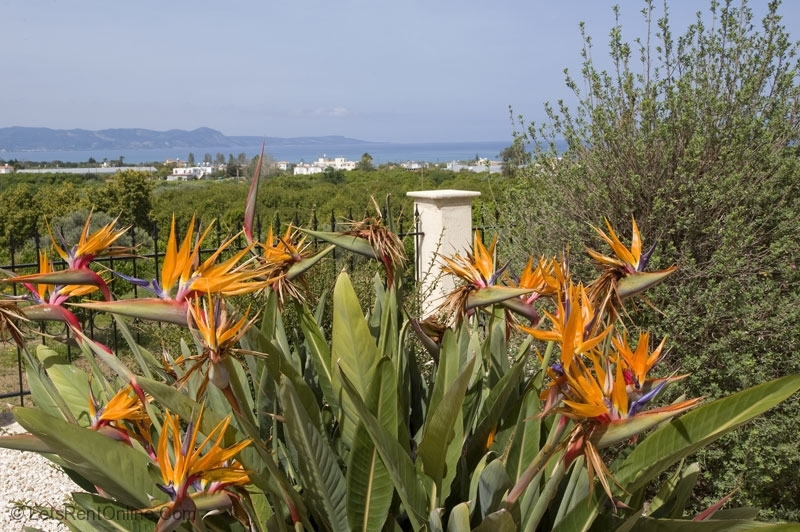 The villa is accessed by security controlled gates which lead up a long driveway past the orange and lemon trees until you reach your private holiday haven. 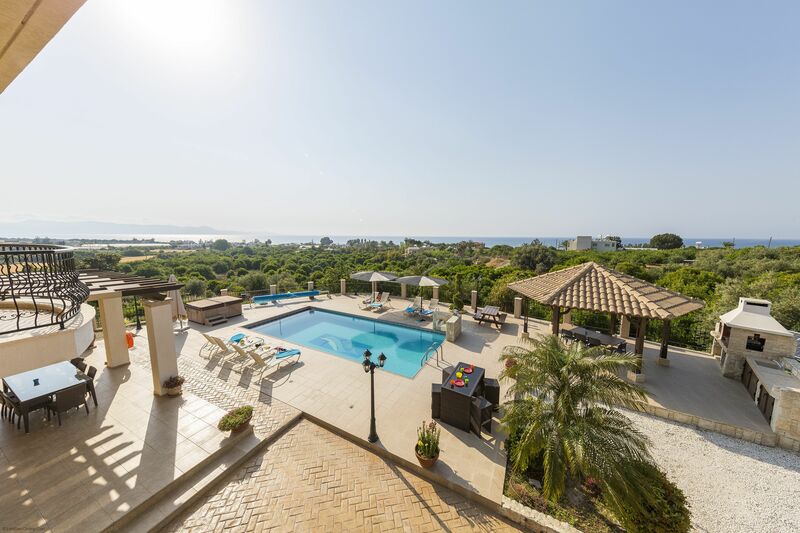 What immediately strikes you is the villa's stature, private position, glistening private pool and of course the stunning Sea Views. 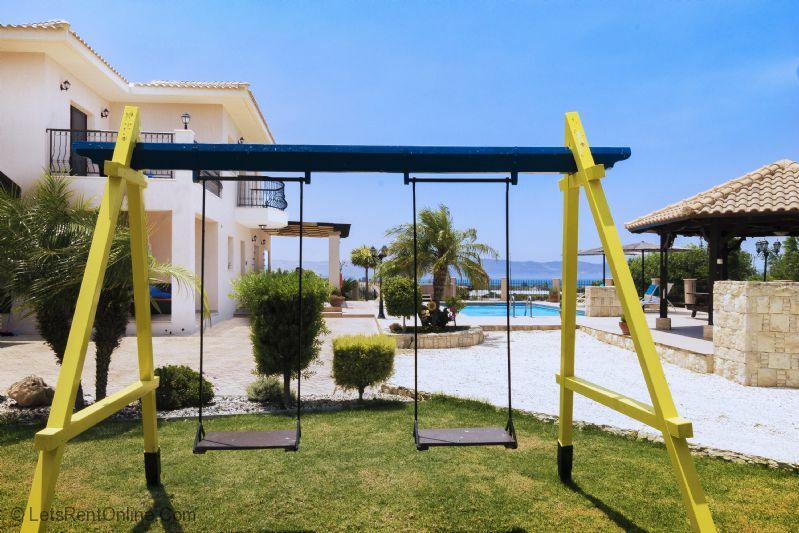 Those of you with young children will have difficulty in containing their excitement at the play equipment on the lawn area but perhaps after a long journey from home and the warmth of a Cyprus afternoon, the private pool will still be favourite for trying out first. If it all gets too much there is always the kids club at Fly Again Restaurant and Bar which you can walk to. 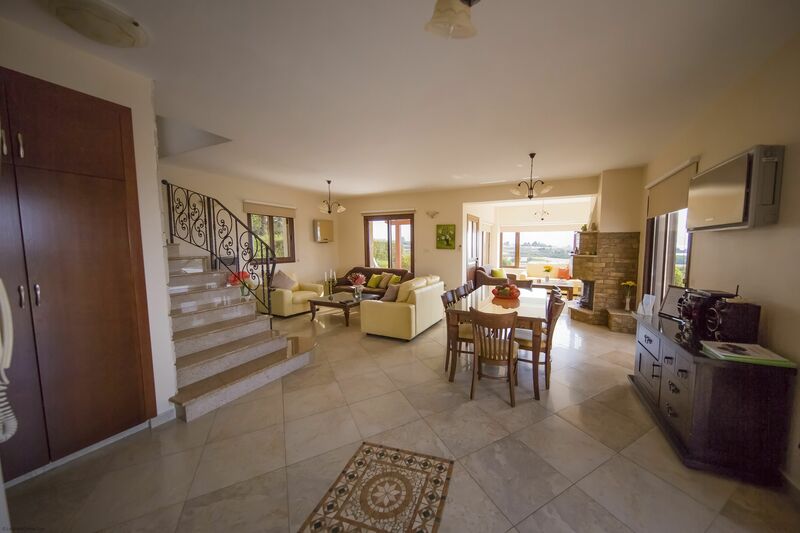 The villa's front door opens into a large airy open plan space comprising the lounge, inside dining area and kitchen. 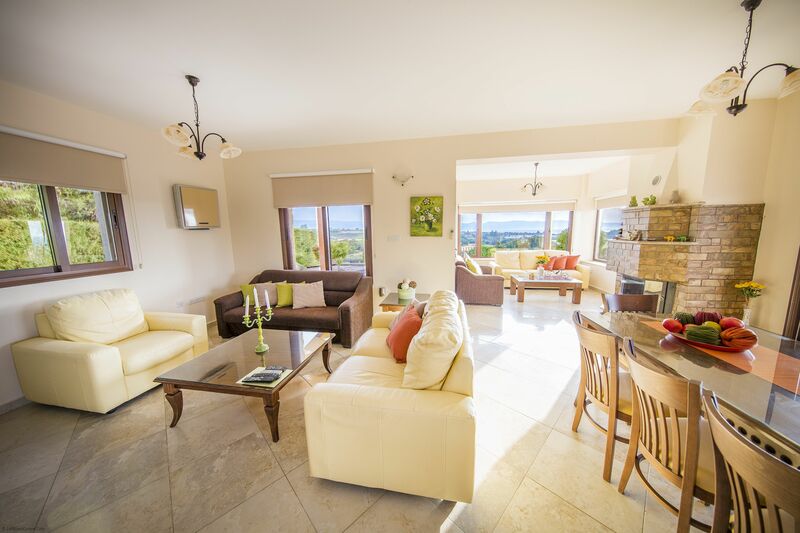 The lounge is furnished with 2 large real leather sofas and has a 42" Flat Screen TV with Satellite & DVD player. There is an open fire for those who wish to take advantage of some daytime sunshine and a cosy evening atmosphere in cooler winter months. The adjacent dining/breakfasting area is equipped with a wooden table and eight chairs. 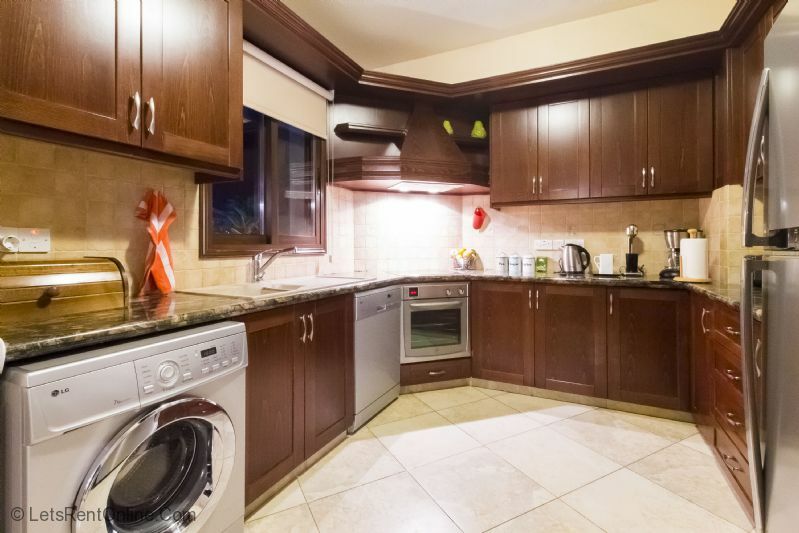 The fully equipped kitchen has all modern appliances including washing machine, dishwasher, large fridge/freezer, oven, hob and extractor hood, microwave and many other extras (coffee maker and frother included). Perhaps the most impressive part of the ground floor is the seating area with feature windows overlooking the private pool and Sea beyond. 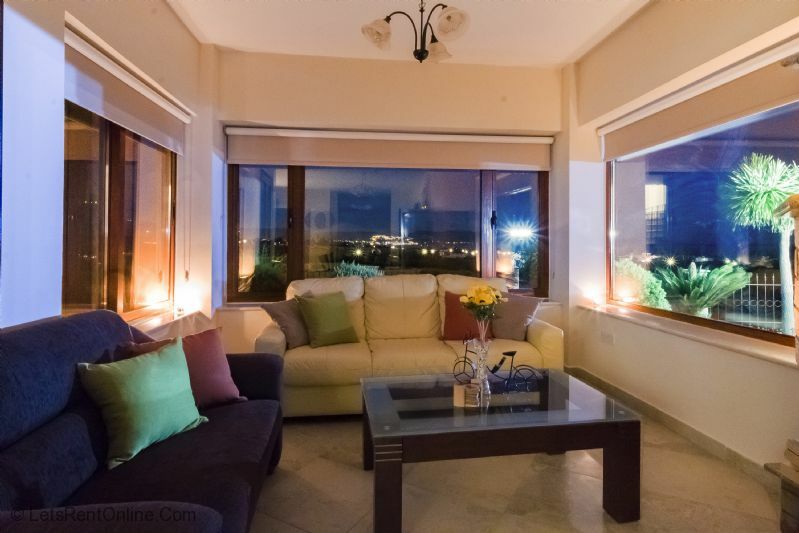 This area is equipped with 2 large sofas which allows a good choice of seating in the inside areas. Making up the ground floor is a twin bedroom (useful for those with mobility issues) and an en-suite shower room with bath and shower over. 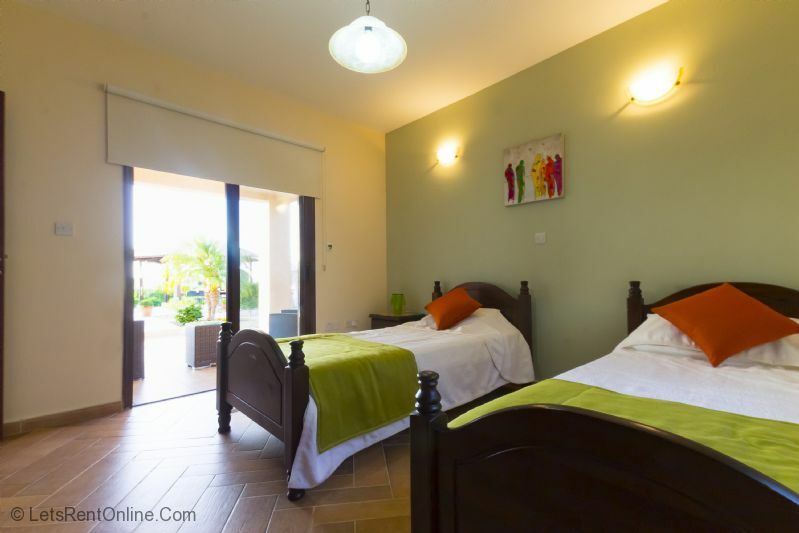 Upstairs, the master bedroom is a double bedroom with king-sized bed. 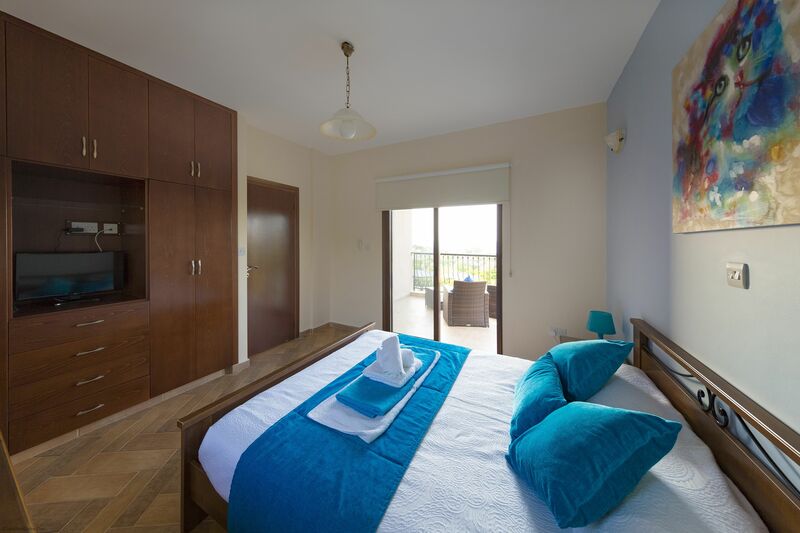 The bedroom further benefits from a choice of 2 balconies, fitted wardrobes with TV (can control Satellite channels), dressing table/mirror and an en-suite bathroom with Jacuzzi bath and shower over. 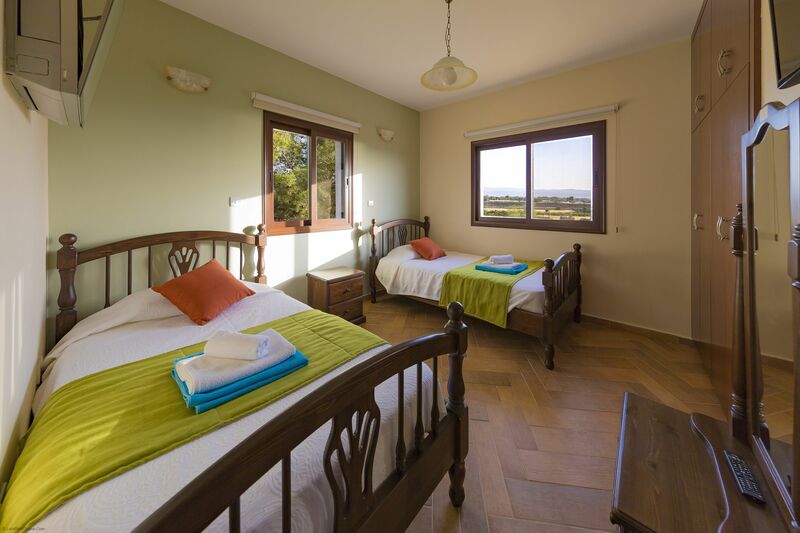 The second bedroom is a double bedroom (again with king-sized bed) and the third is a twin. 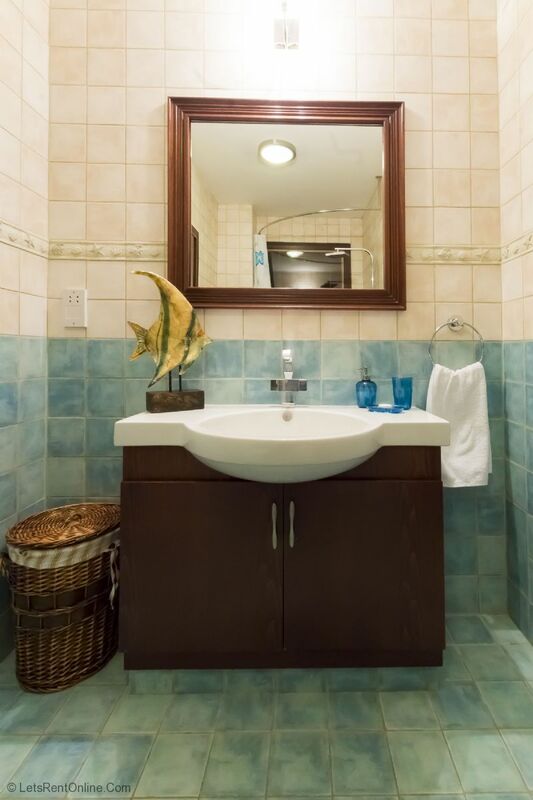 Between the bedrooms is a large bathroom with bath and shower. 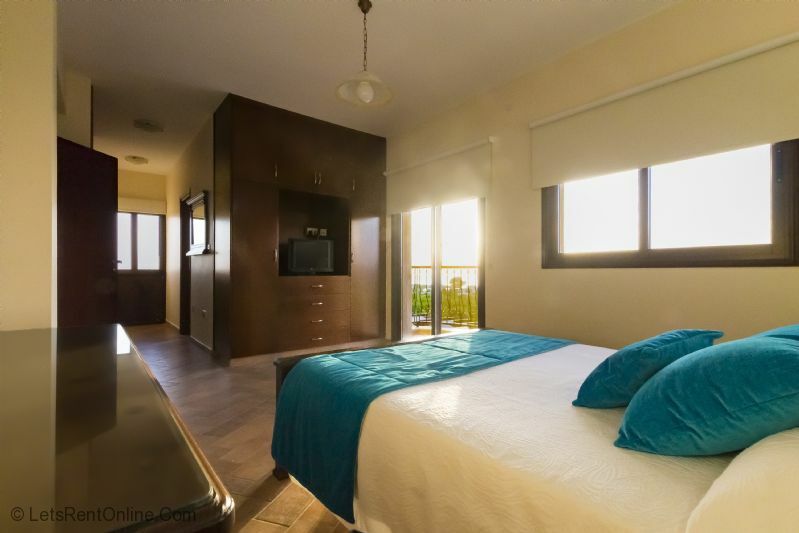 All bedrooms benefit from TV's neatly set within the fitted wardrobes with Satellite controlled by the receiver in the lounge (all except the master bedroom). 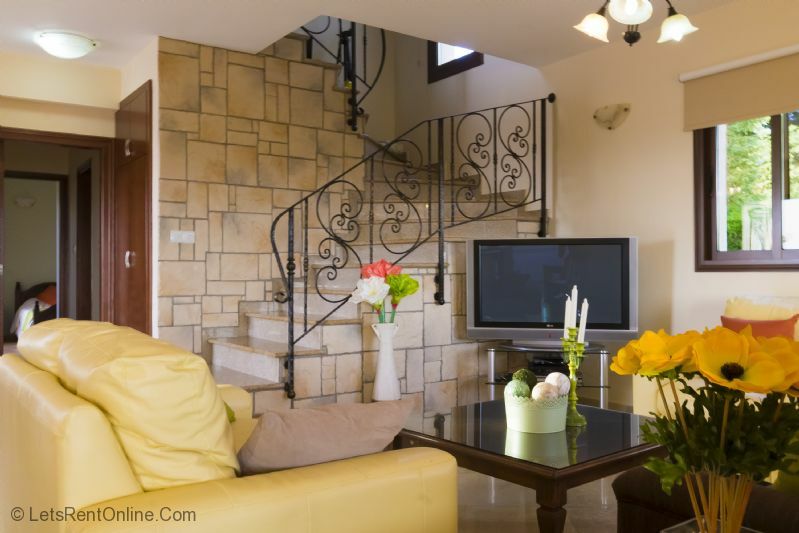 The villa is fully air-conditioned with a sophisticated modern system. 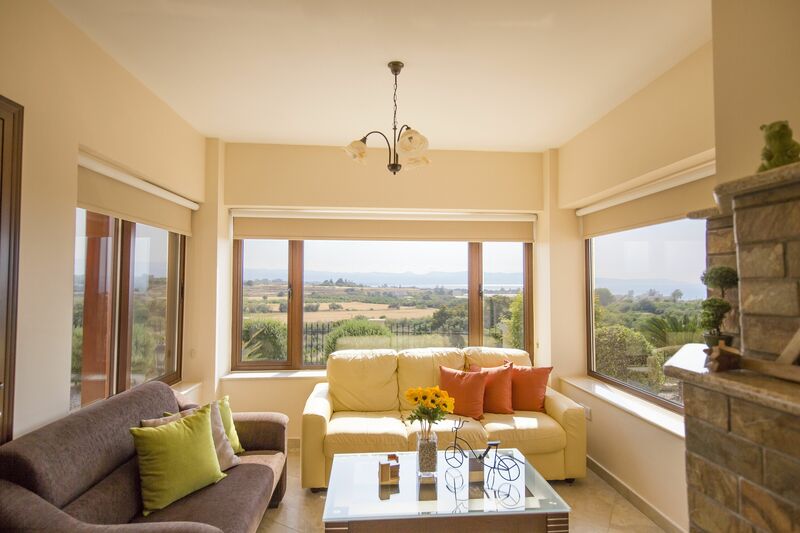 The villa benefits from flyscreens throughout. A travel cot and highchair are supplied free of charge on request. 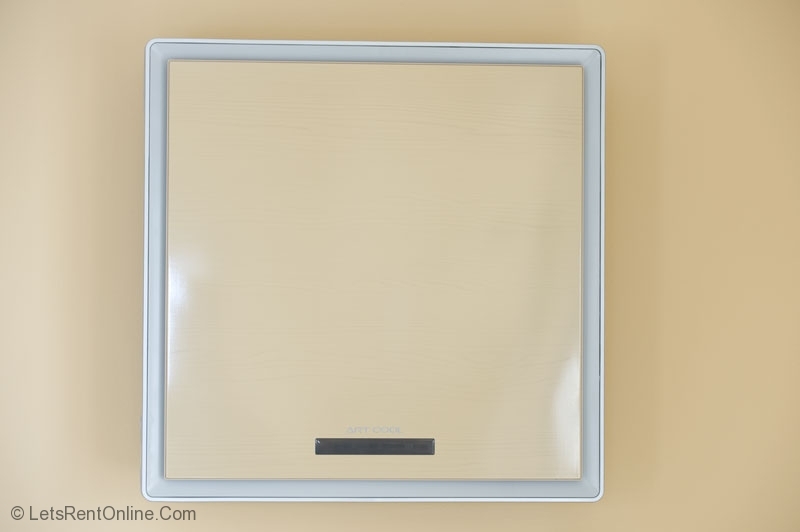 Other extras such as hairdryer, pool towels, and safety deposit box are also provided. 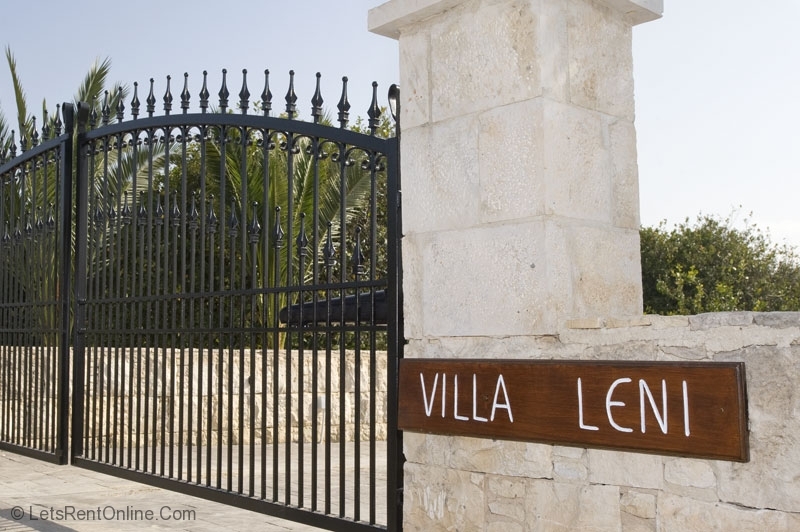 The outside areas of 'Villa Leni' in Argaka are accessed by a long private driveway with fruit orchards on either side. 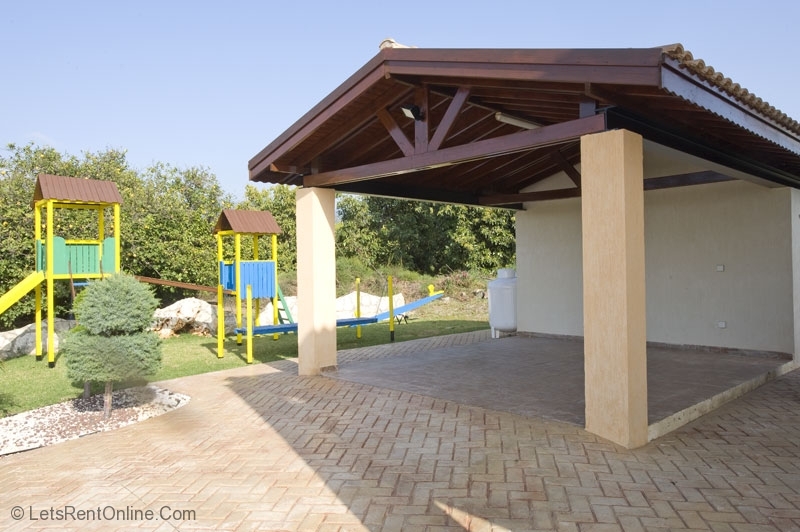 There is ample parking at the rear and side of the house including under a shaded car port with space for 2 cars. 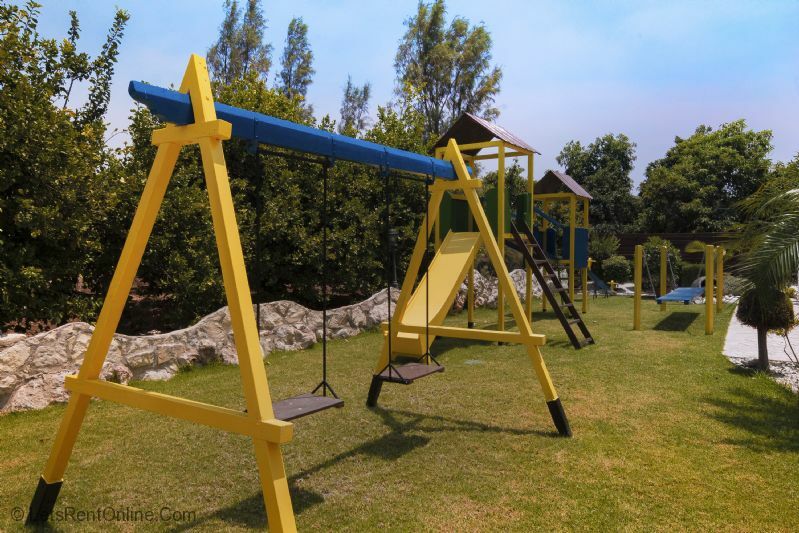 A large area laid to lawn with childrens play equipment (2 x swings, chute, see saw and climbing apparatus) sits to the left of the house as you approach and allows for children to play safely (in view of all outside seating areas). 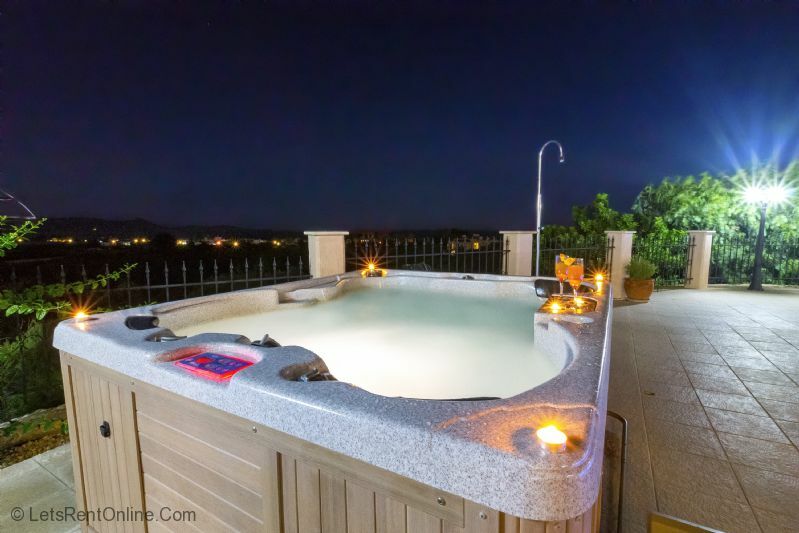 The centrepiece of the holiday villa's ground is a very inviting 9m x 4m private pool (which can be heated) with Jacuzzi hot tub positioned at the end. 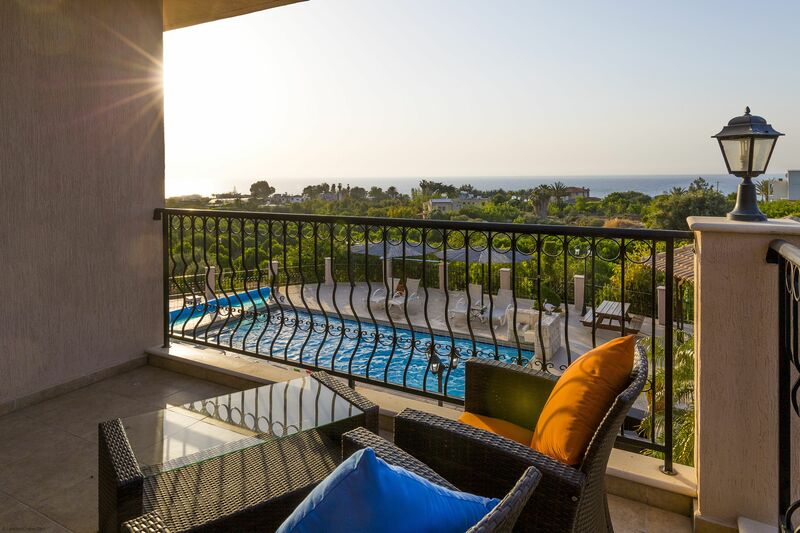 The spacious pool terrace is nicely equipped with 8 large sun loungers that benefit from large overhanging parasols and drinks tables. A picnic bench allows for casual snacking or coffee while absorbing the fresh sea air. 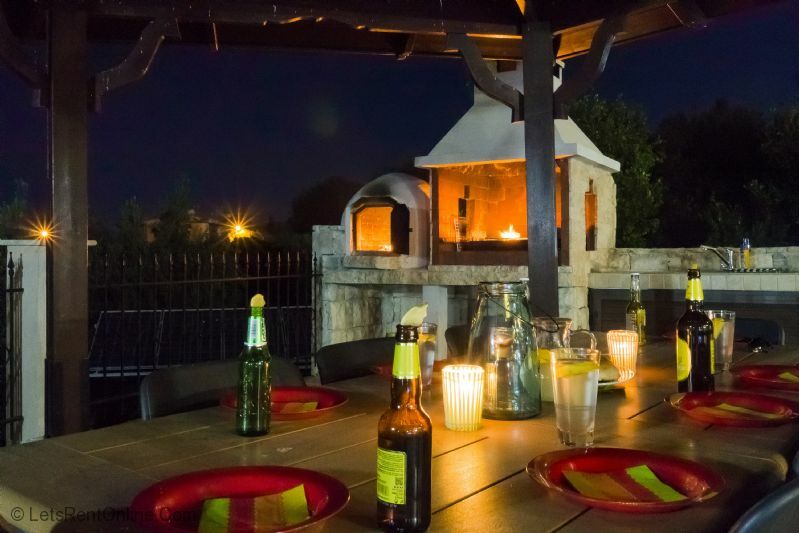 A large gazebo with table and chairs to seat 8 comfortably for lunch or dinner is accompanied by a large stone built BBQ and clay oven. 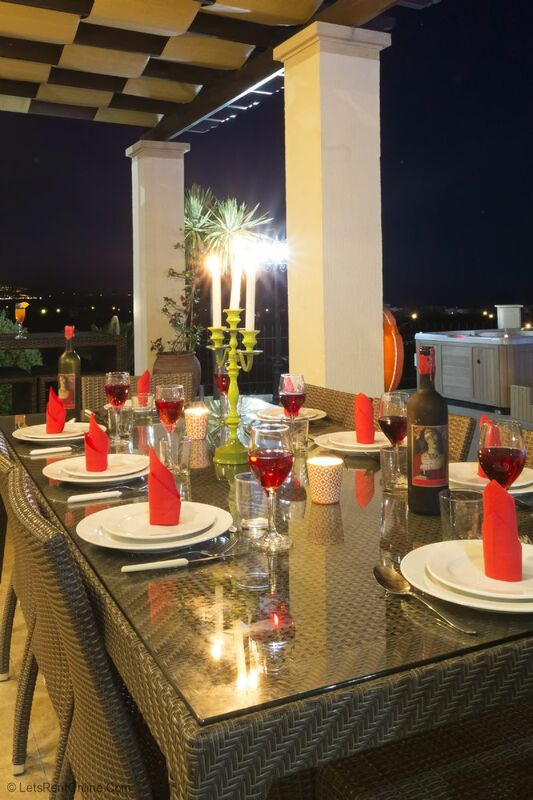 This creates the ideal setting for alfresco dining and socialising with your party on holiday. 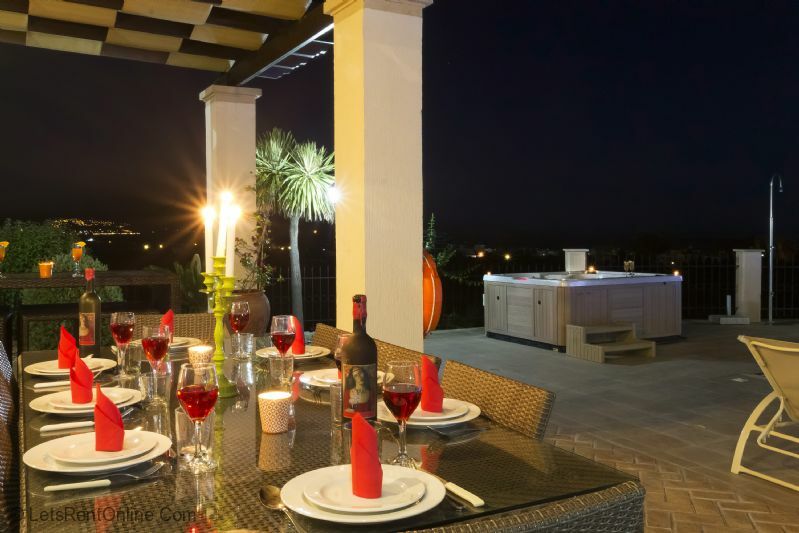 An outside shower and long terrace with further table and chairs to seat 8 completes the outside areas. 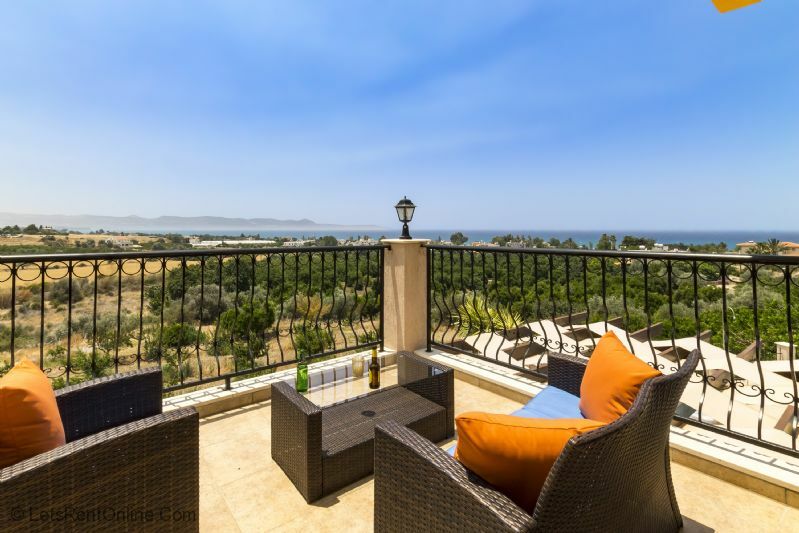 Most of the outside areas afford spectacular uninterrupted views of the whole coastline area as well as the impressive hillside backdrop. The pretty flowers, shrubs and trees add to the atmosphere, making it the ideal place for relaxing in the sun or shade. ''We had a great holiday thank you. 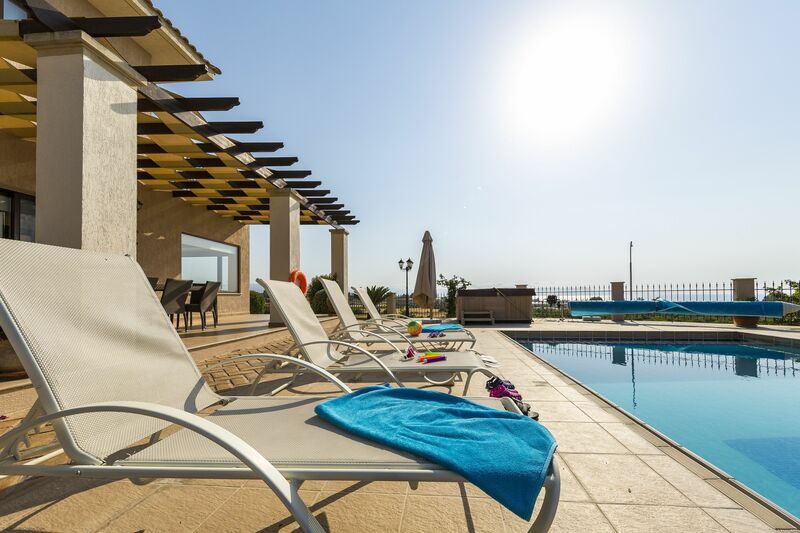 We loved Villa Leni - spacious, clean, well equipped, great pool and outdoor space. 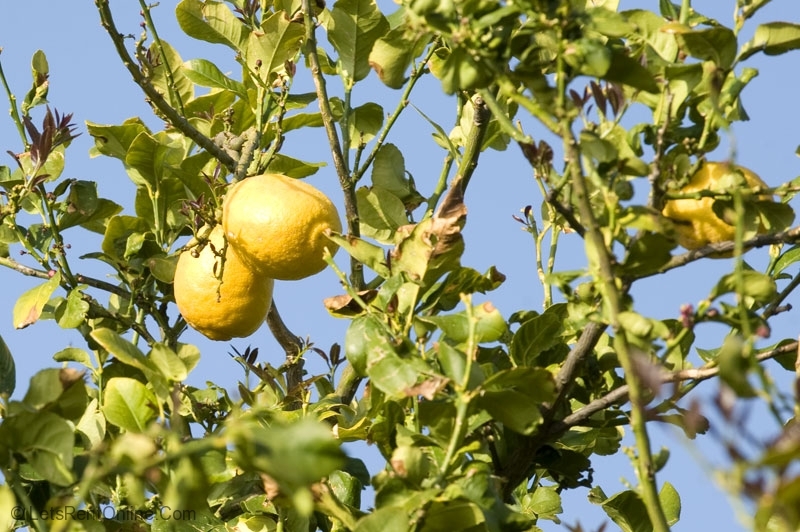 Location in Argaka was good - quiet most of the time, loved the surrounding orange and lemon groves. ''Good Afternoon Steven, thank you for your email. More than happy to give feedback. The property was fantastic. We all loved it. Both inside and outside well maintained and clean. 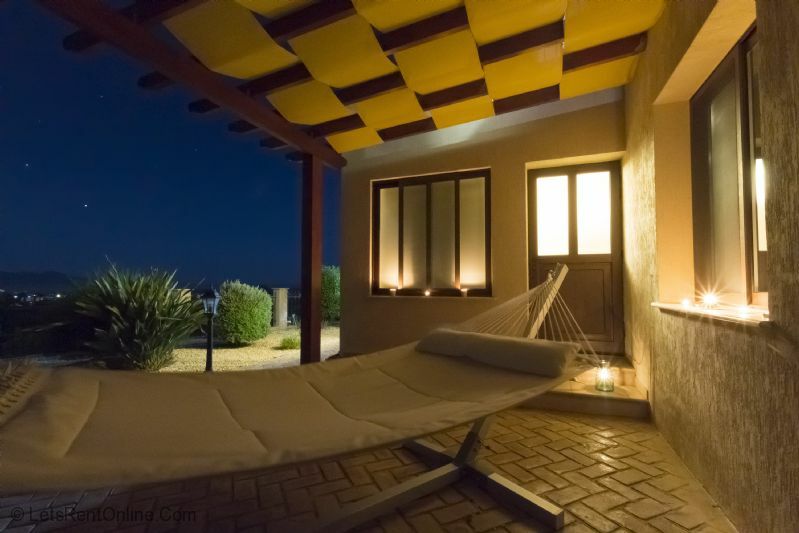 The Villa was very spacious and well equipped, the showers really good and we loved the sitting areas, both inside and out. 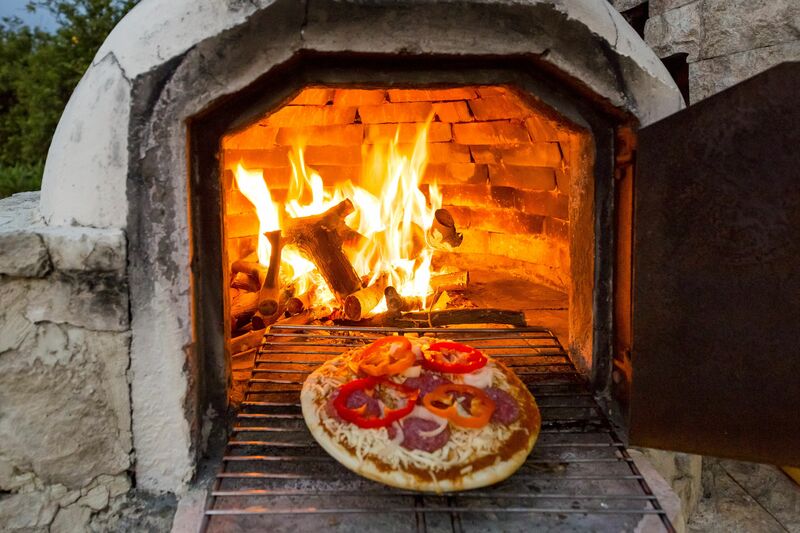 Having a BBQ was great as well as the Pizza oven. We liked Santa Barbara, Coast and Pas to Kima , all in Argaka, not so keen on Fly Again Irish pub, food not good, ok for a drink. Recommend the beach in Polis next to camping site, mix of sand and shingle, very quiet, easy access and a restaurant, shower and toilet facilities.We also had a half day boat hire from Latchi Watersports, very friendly people and professional. Lovely morning going up coast, stopping off at various points for swimming and snorkelling, highly recommend. 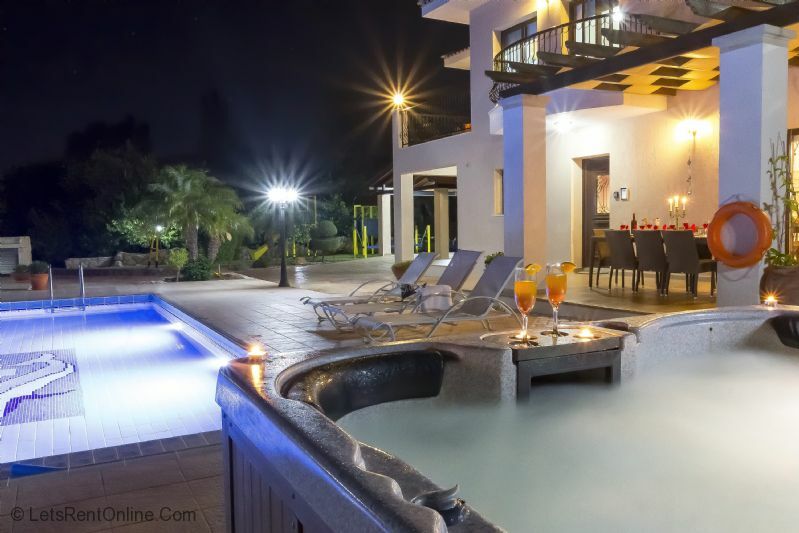 ''The villa was everything we were expecting and more. 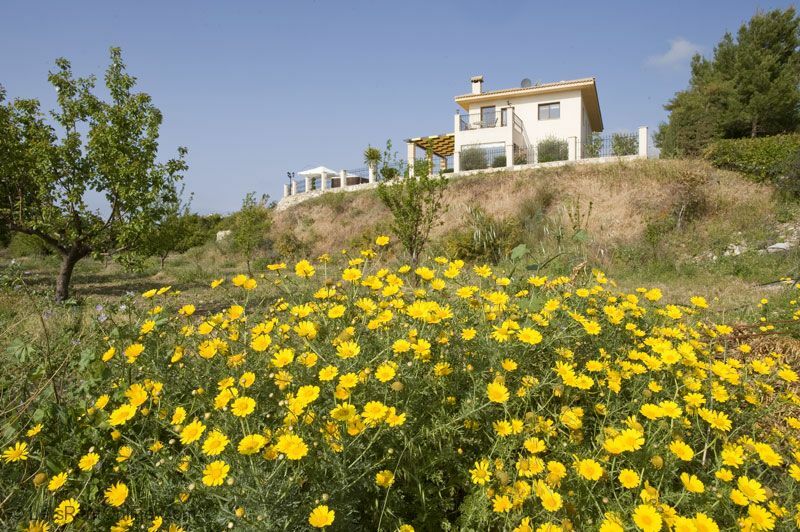 Easy to find in a quiet but very pleasant part of Cyprus. 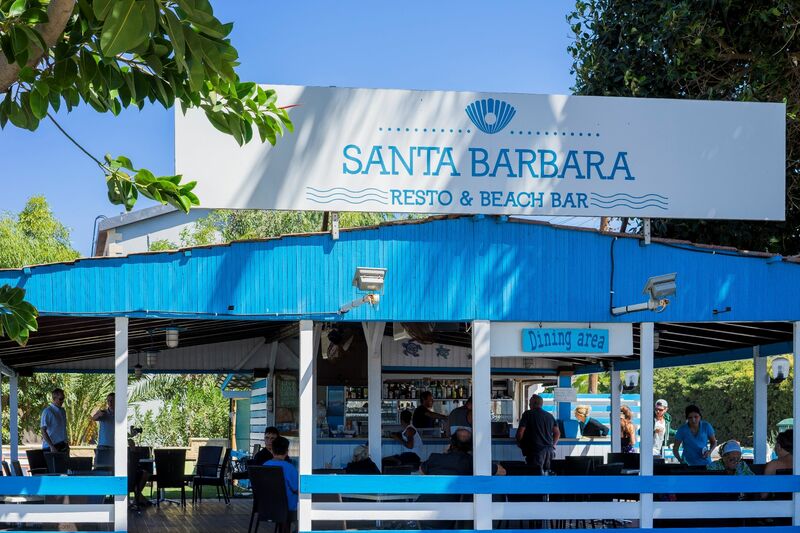 We regularly ate at Santa Barbara Beach Bar & Resto and would highly recommend it. We also had a fantastic dinner at Porto Latchi in Latsi. We hired Jet Ski's from Latchi Watersports and used them from Anassa Beach which was great fun. Finally, Maria put us in touch with a lady called Kali who came to the villa and gave us all private massages which were fab! 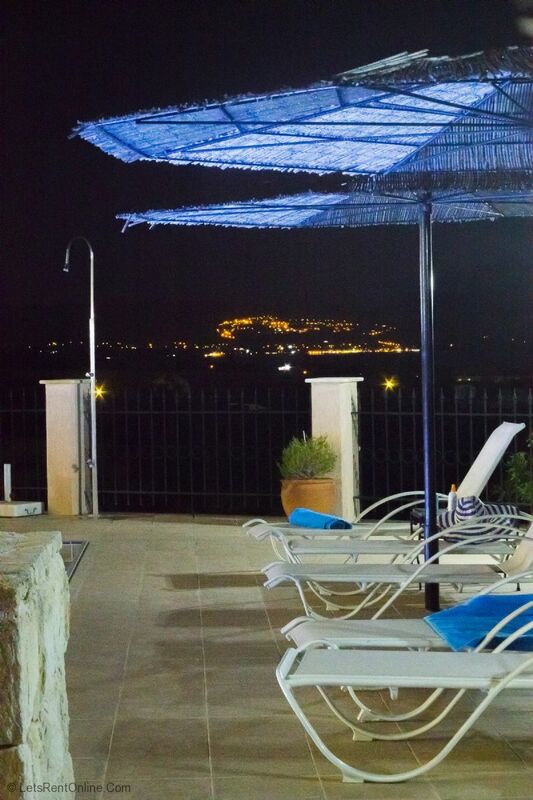 ''Villa Leni was amazing! It had everything we needed for a great family holiday. We enjoyed the pool and hot tub and the kids played on the park. 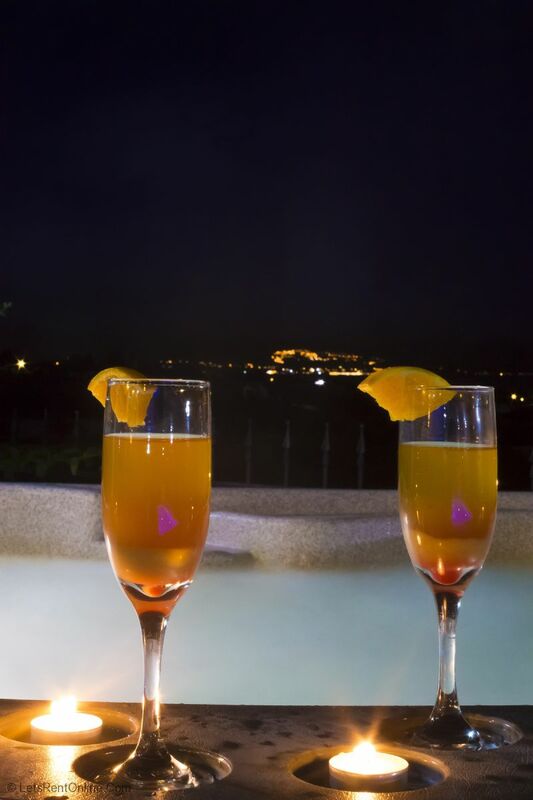 We also loved watching the sunset every night and enjoying the excellent views. 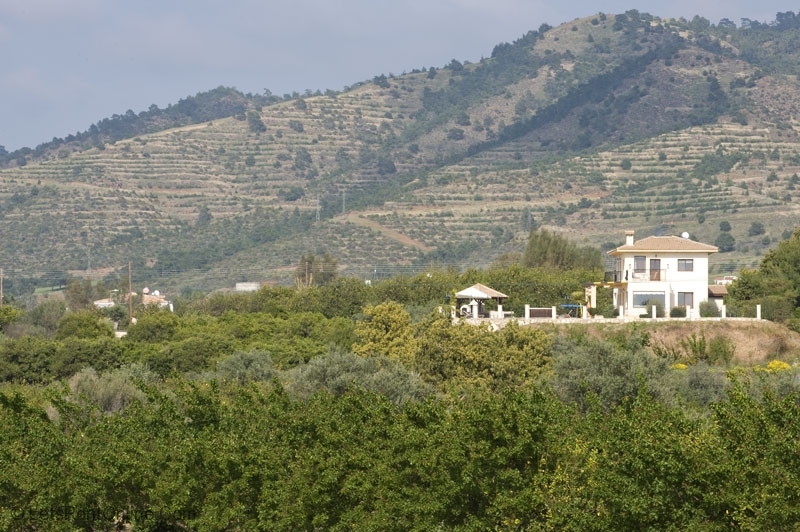 The surroundings of the villa are beautiful, it felt luxurious. The location was good. It was peaceful and in a beautiful area and close to a bar and the beach. 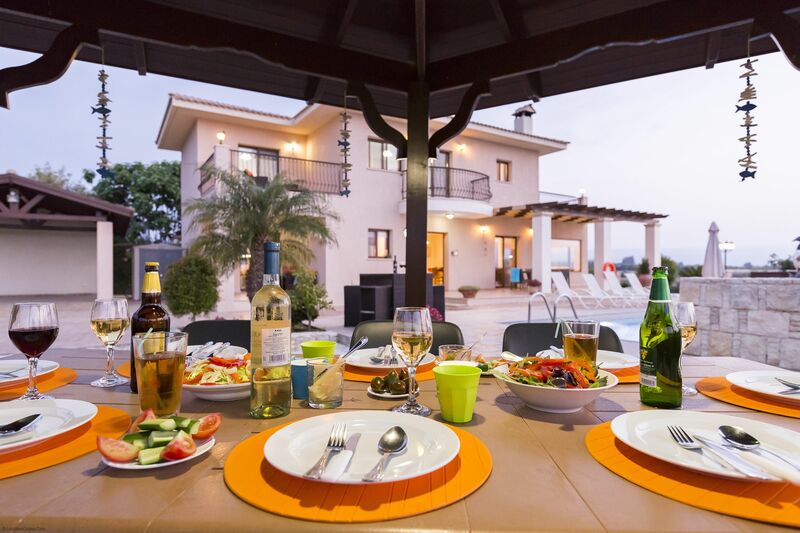 There are larger supermarkets and restaurants which are a small drive to Polis or Latchi. 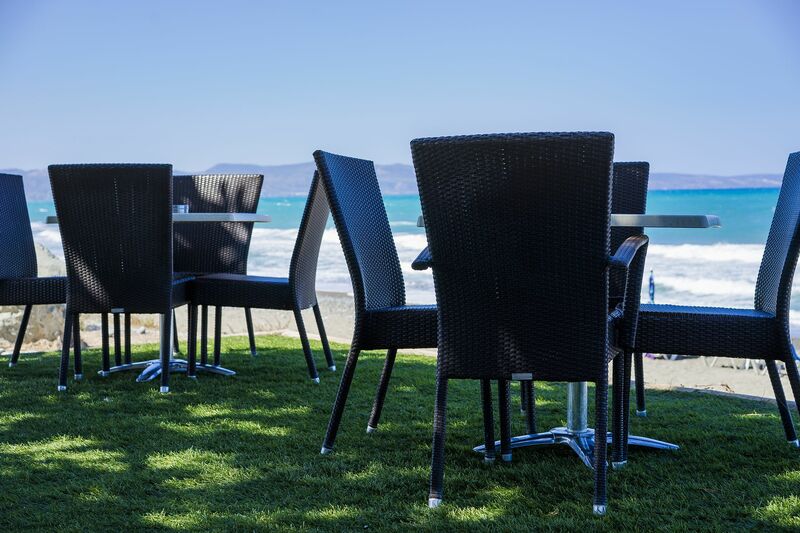 We enjoyed the Fly again beach bar and took many trips into Polis and Latchi for delicious food. 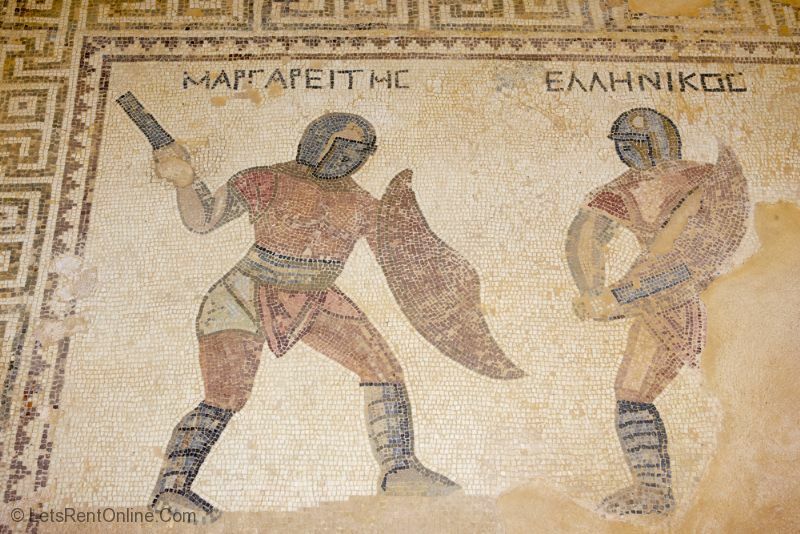 We particularly liked the Moustakallis in Polis. The service and quality of food was exceptional. 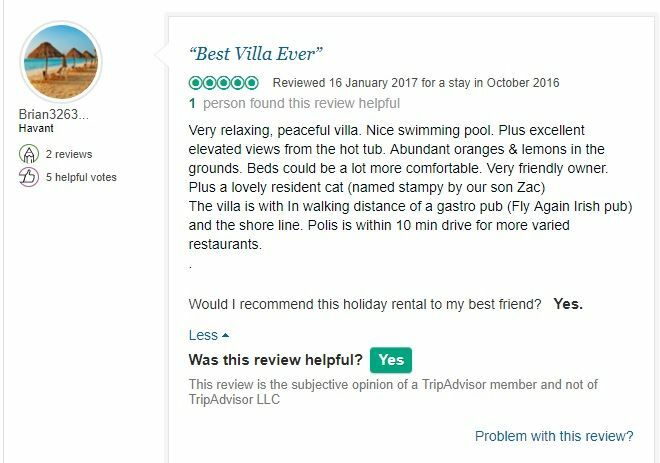 We thought that the communications before the holiday were great, feedback was always very quick and we had all the info we needed to make our stay and journey hassle free. Very satisfied with the owners. 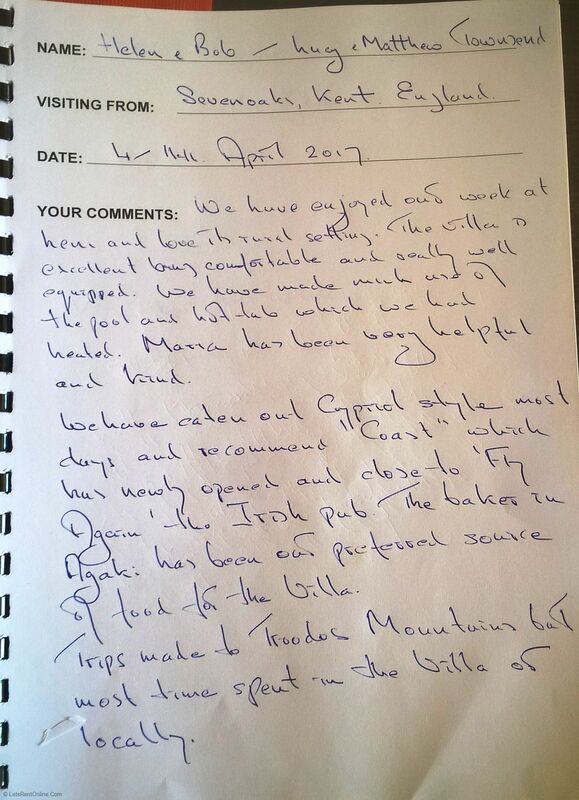 They were extremely welcoming with a food and drinks package on arrival and regular visits from Maria to check we were all ok. 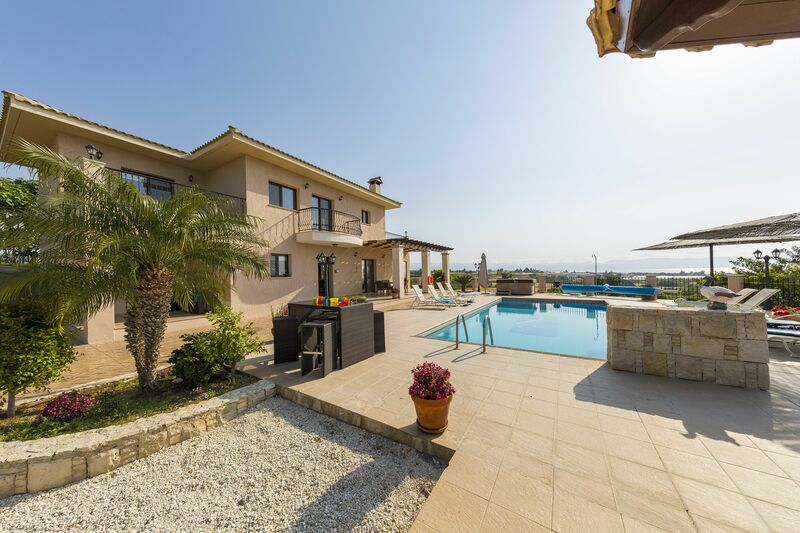 The villa was extremely well kept throughout our stay by Mario. We made use of recommended taxi to the airport which was hassle free, he was waiting for us at the airport as soon as we arrived. 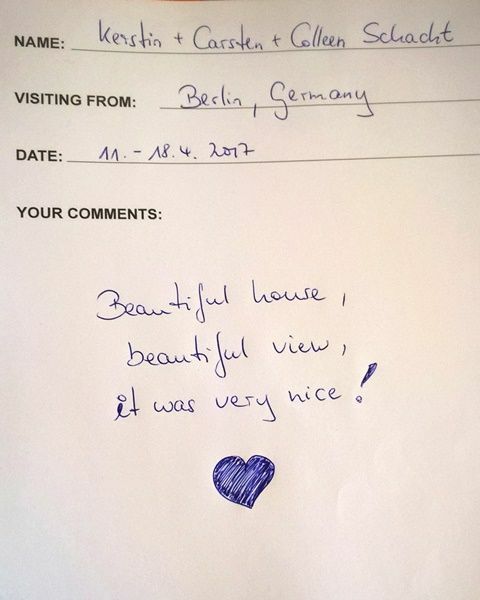 ''Just want to say... What a beautiful villa you have , so gorgeous. The property was so clean and well kept. The location was very beautiful and calm. Just the way we wanted it. 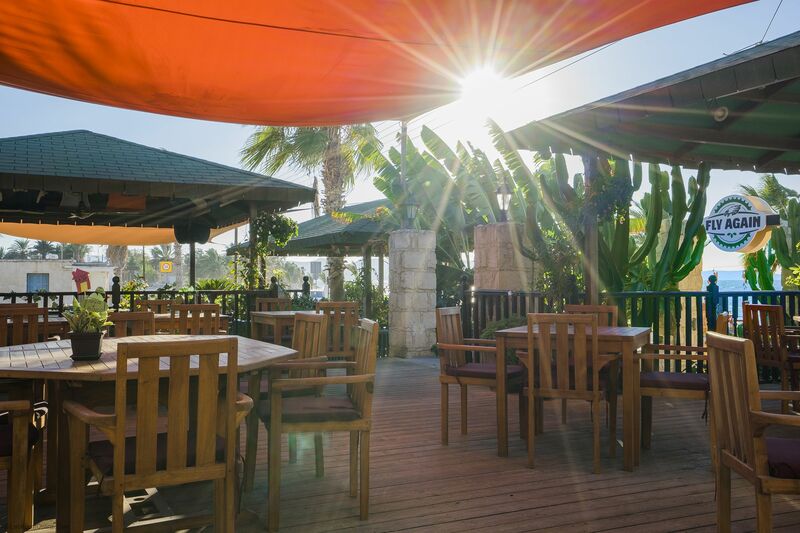 We most liked the Argaka beach ( free sunbeds) and the Flying irish bar at the beach. And Latchi watercenter was a must. The harbour and rental boats in the beautiful ocean was a big hit. 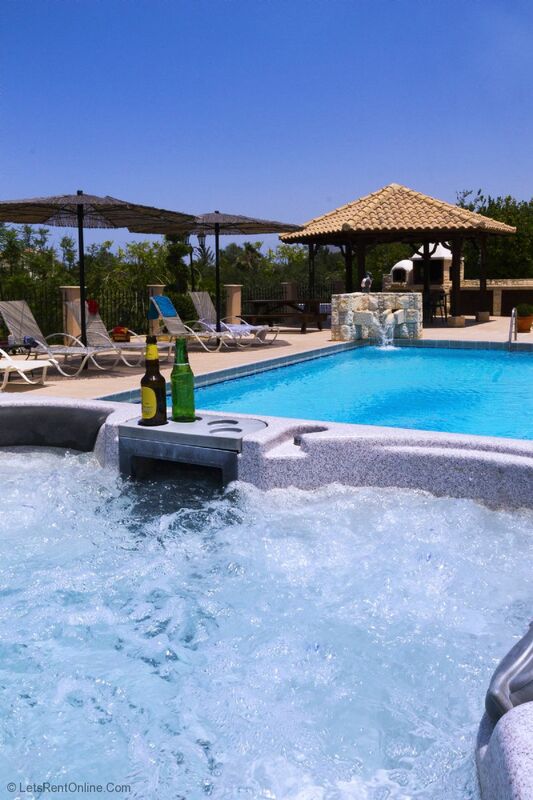 ''The villa was amazing, the outside area is beautiful and the pool lovely and cleaned on a regular basis. The added extras such as the hammock was a nice touch. 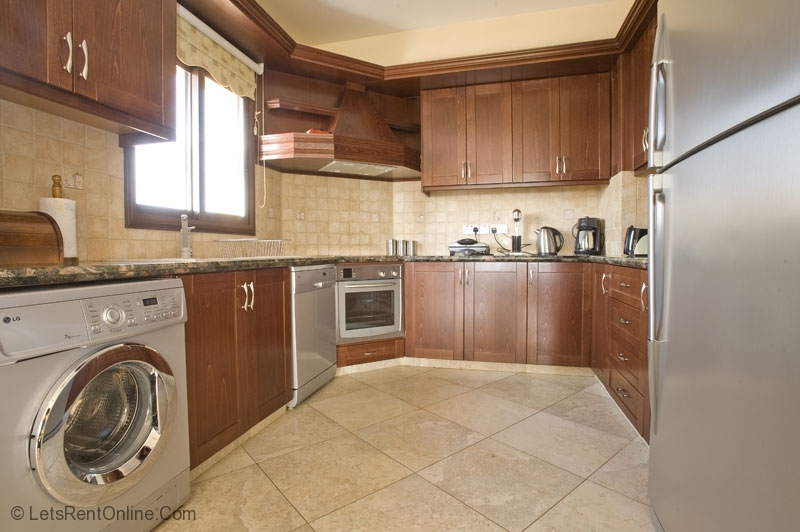 The kitchen is well equipped and it was good to see a new fridge/ freezer. 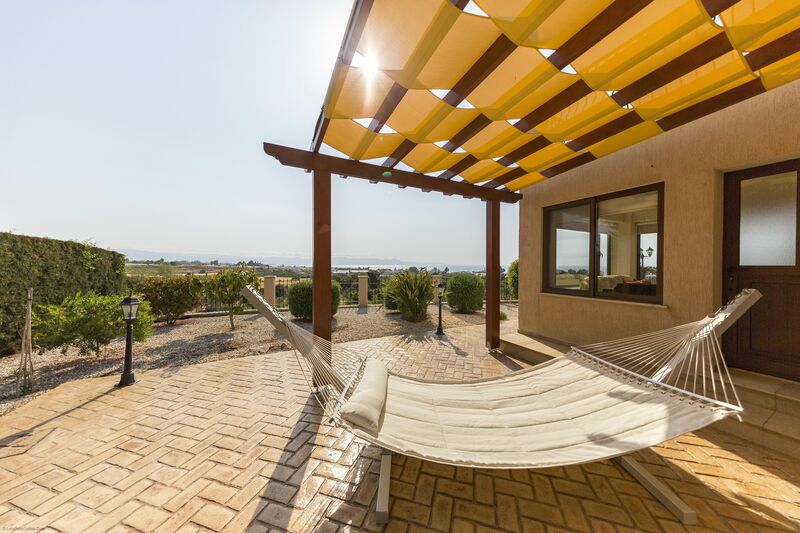 Location was excellent with lovely views. 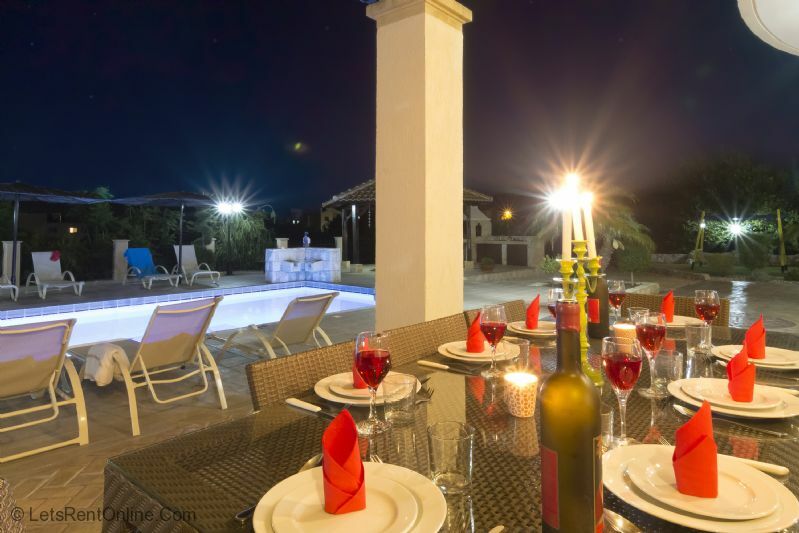 The villa is only a short distance from some bars, restaurants and supermarkets. We loved fly again bar and Resturant. Beautiful location next to the beach. We had lovely meals here and our children loved the kids club that was there this year. 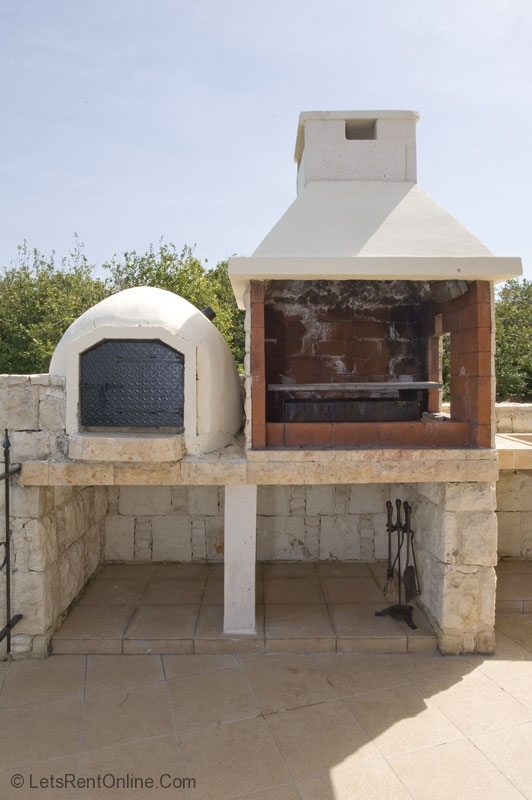 We visited Latchi on a number of occasions, once for a meal and other times to the beach. 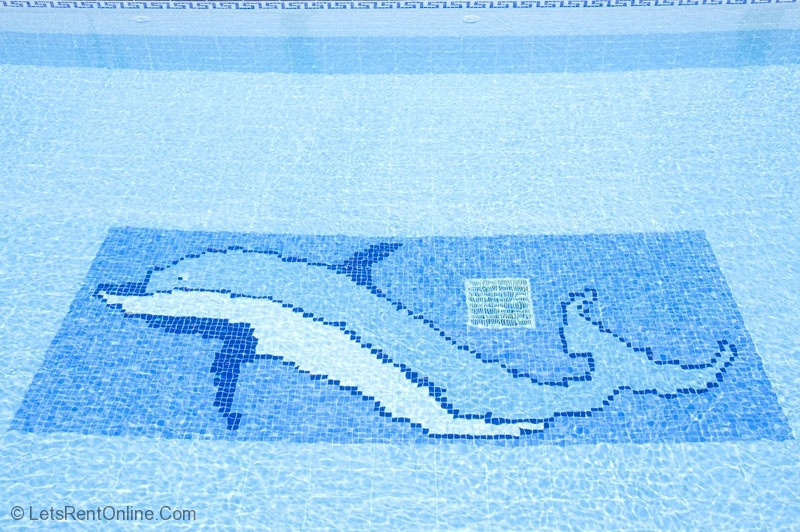 On our last day we went to paphos water park, we would definitely recommend a day out there. ''Happy to provide some feedback on Villa Leni. 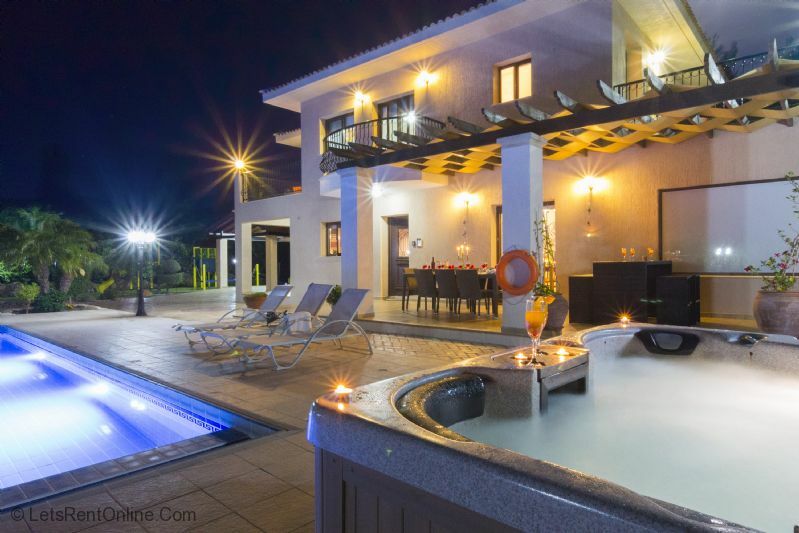 The villa surpassed our expectations. We have stayed in a number of different villas over the years but this was the best. Argaka is a perfect location. Sea view, very quiet but close enough to go out for meals and visit Polis or Latchi. 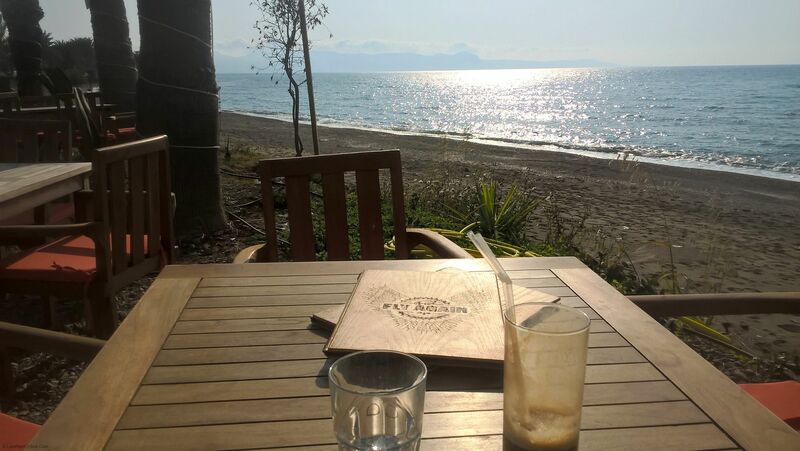 We enjoyed the meals at Soulis in Latchi as you could sit next to the sea and there was a great menu and superb service. 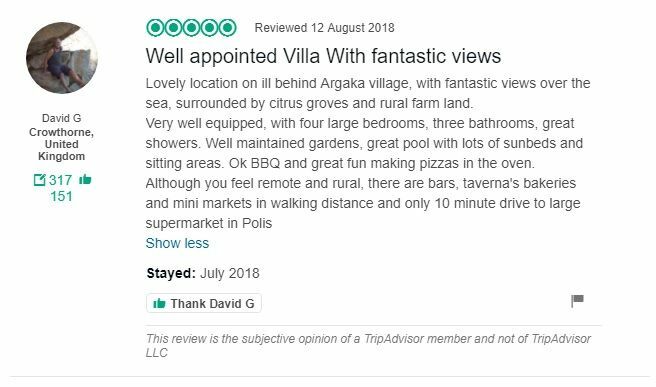 Finikas in Polis was also good value. 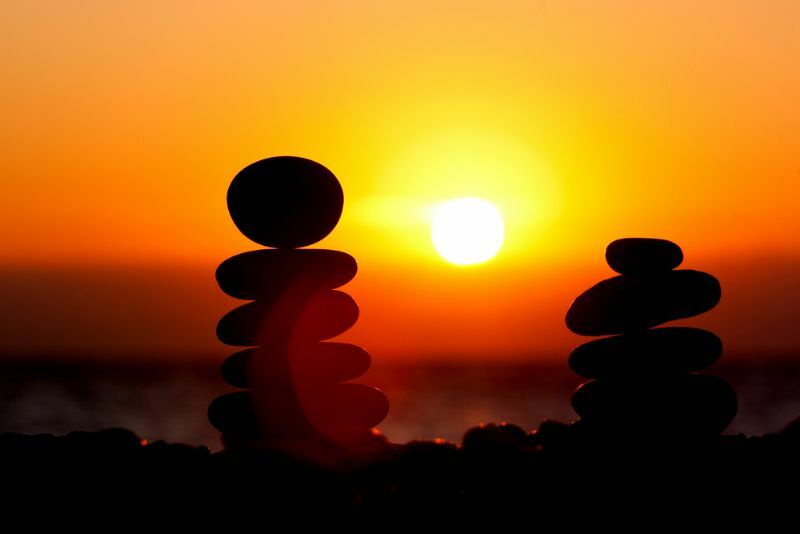 Santa Barbara was a good venue to watch the sun set and very romantic. 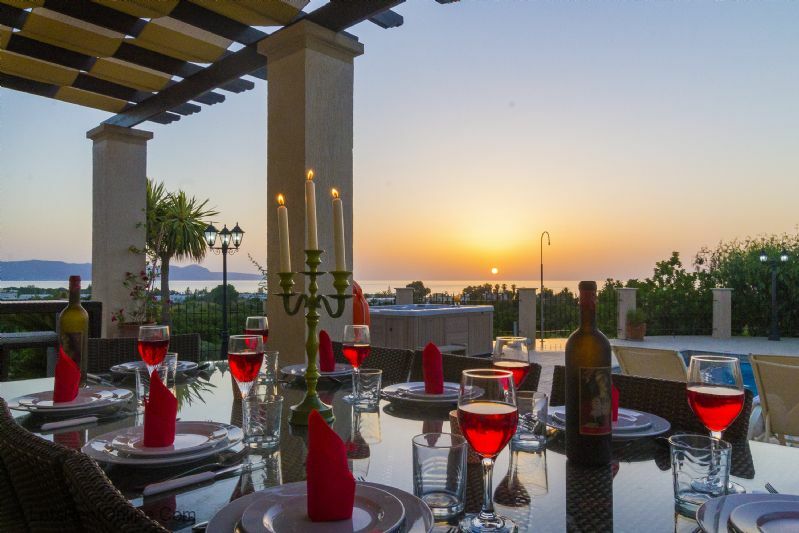 ''The villa was beautiful, well furnished and spacious, perfect for a family of 5. 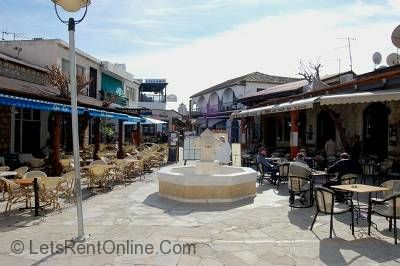 It was close to the beach and restaurants, with local shops nearby. We ate at ‘Fly Again’ a few times, very good service and the food was delicious. 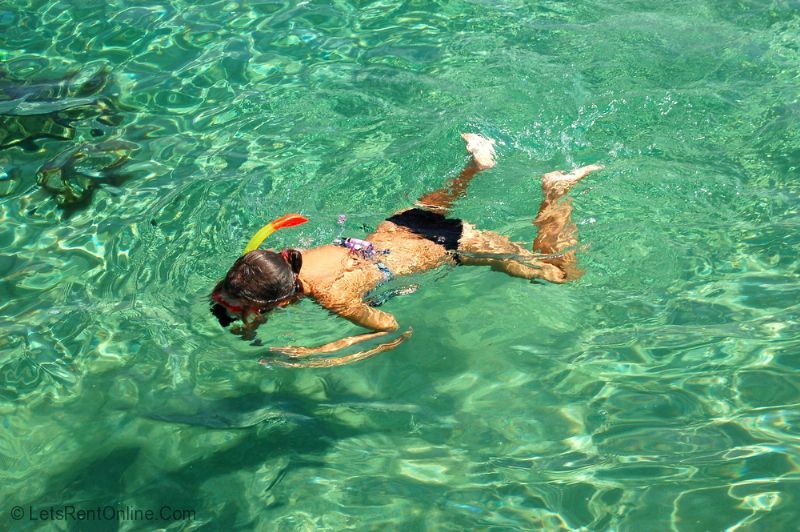 We highly recommend some of the activities that Latchi Watersports offer, in particular hiring a boat for a whole day which includes sightseeing, optional snorkelling and turtle spotting. 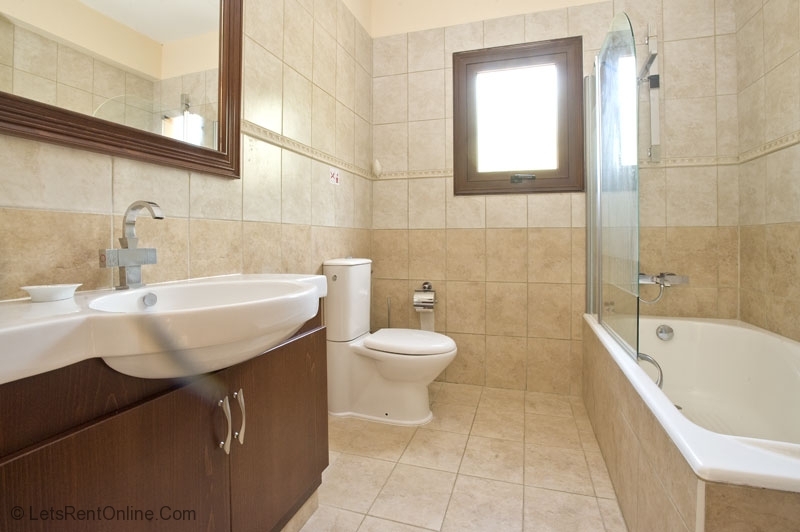 ''The property was lovely- as described and pictured. The property was fitted out to a high standard and was beautifully furnished, the kitchen equipment was endless and was a home from home. The only thing I would have like was plastic cups for the children when eating outside- but that's just me being a panicking mum! The location was a little more remote than I thought- but we hired a car, I would recommend a car is needed. The views were super and we could hear the waves from the sea whilst sitting on our sun loungers! We found a cut through from the villa to the Irish bar- I'd recommend letting customers know about this as we walked all the way round twice. 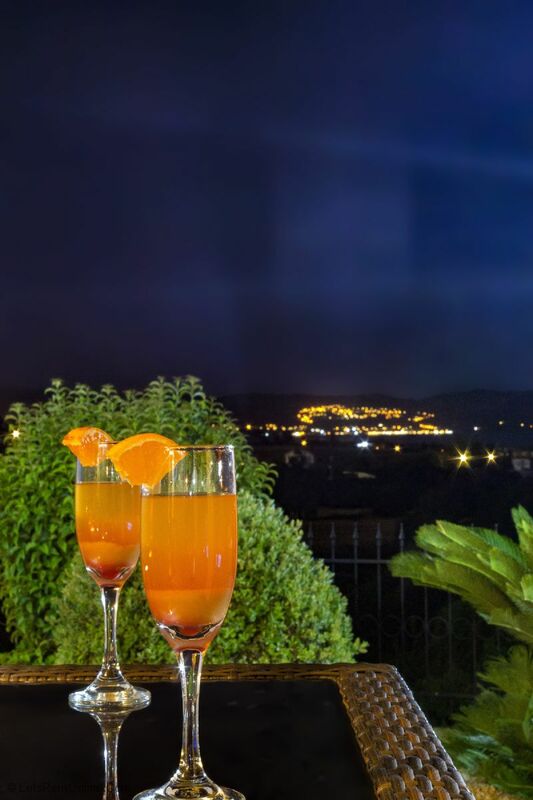 Go out of the villa gates, turn left, then right at the end of the road, walk up the hill (round a bend or two) and there's a wide dirt track that cuts down alongside the Irish bar/ restaurant. 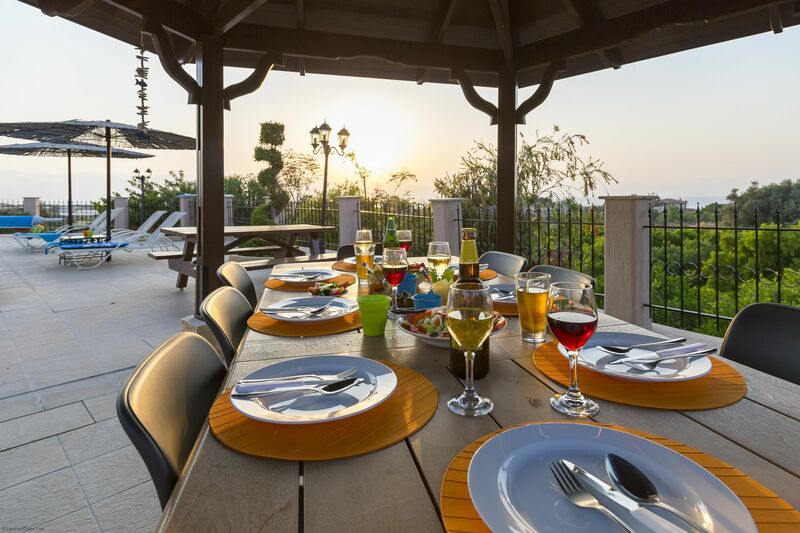 ''The villa excelled our expectations, from the extremely clean and homely décor to the pool & eating areas, the park was a fantastic feature for our children (4/7/8). 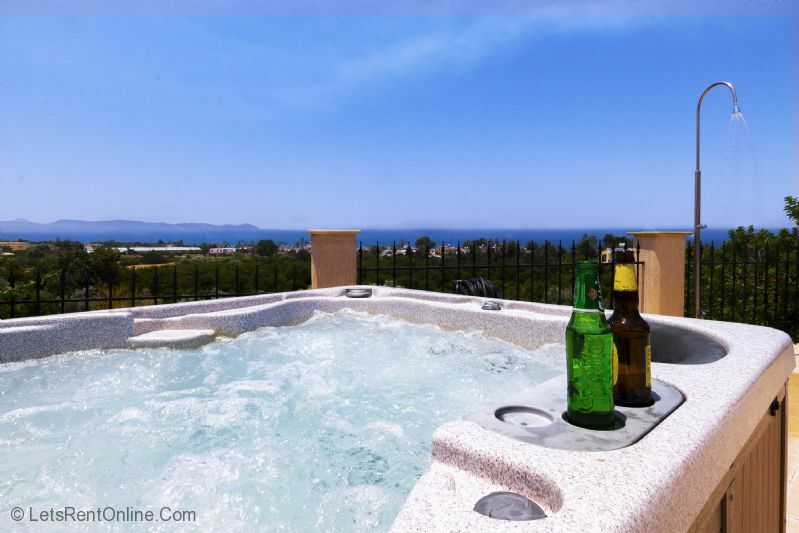 The location was great from a privacy point of view and the views were amazing. The local shops/bars/restaurants were in a walkable distance. We did feel that next time we would have hired a car as other attractions were too far away for walking and also any trips to the beach/waterparks etc gets costly by going by taxi. We went to the Fly Again (Irish pub) on a few occasions and found the staff & food very pleasant. We took part in the quiz night which was good fun. All the local shops were friendly, well stocked and fairly reasonable for being so remote. 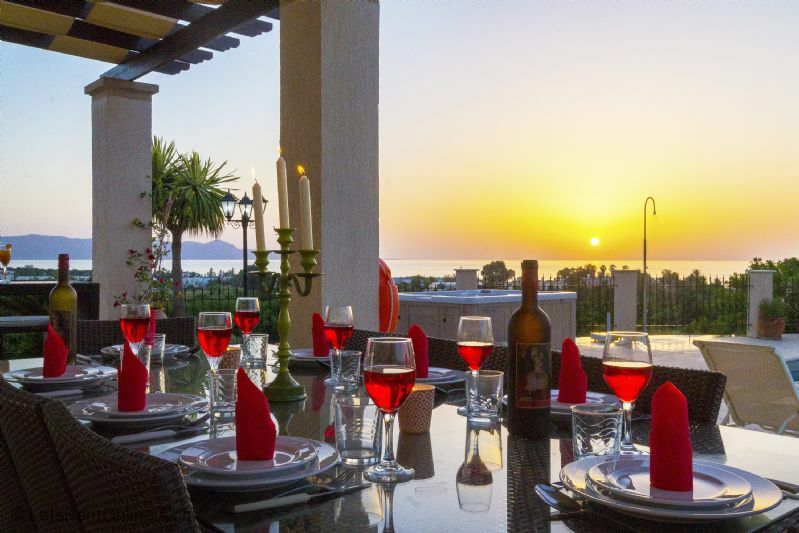 ''The villa was in immaculate condition and the welcome pack was a great surprise, we probably could have gone the first night and breakfast the following day without shopping. 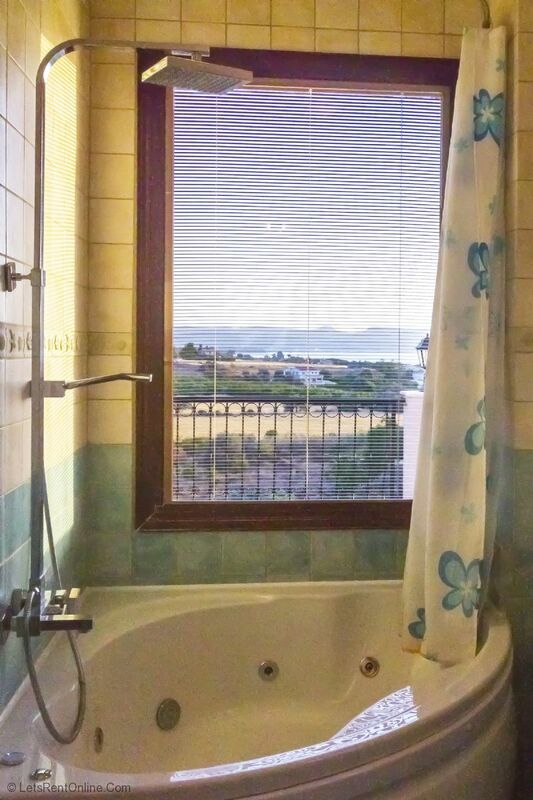 The Villa was well equipped, and the view was fantastic. The location for us was perfect. 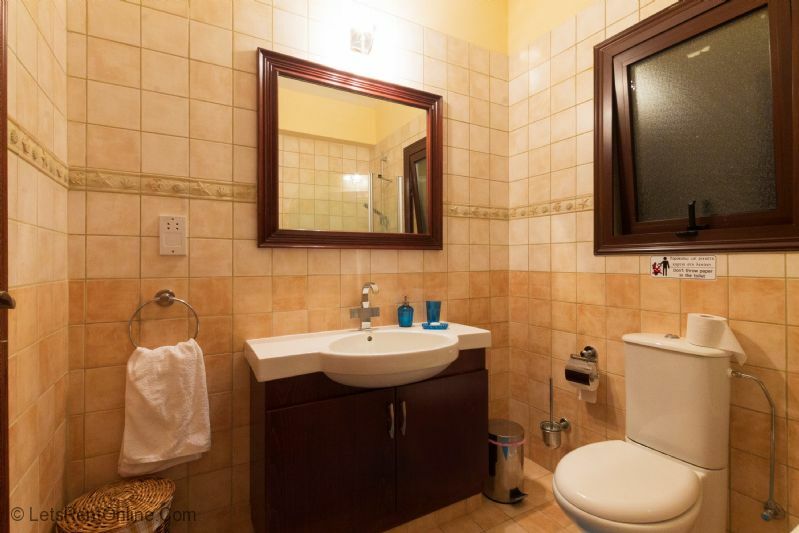 It is in a quiet location with a lot of privacy. 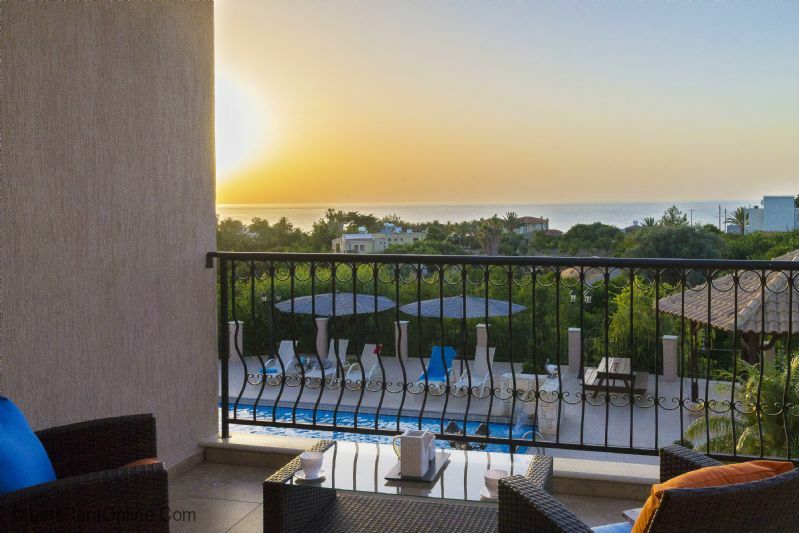 The view of the Sea is excellent, and the local amenities are close by without being intrusive. Although not the busiest area there are local attractions close by (by car). The bakery down the road is great, and there is a supermarket 6km away which has a much larger selection. 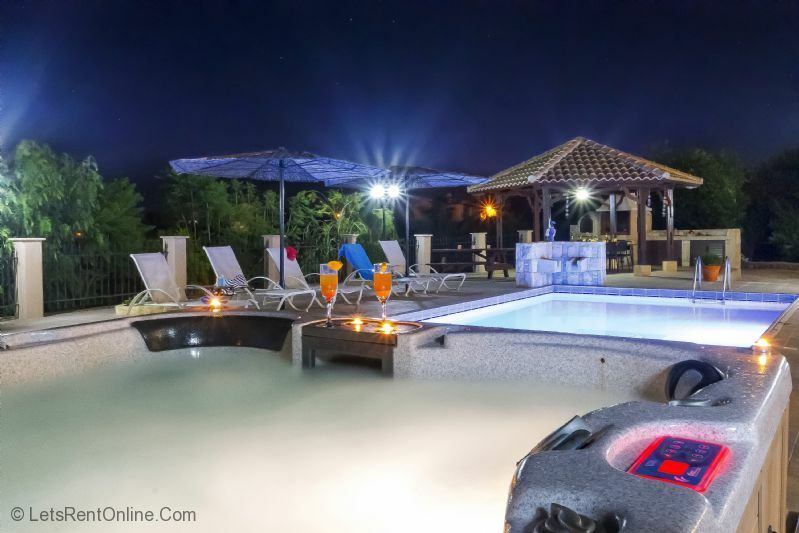 We hired a boat from Latchi watersports center with the LetsRentOnline discount. The staff were knowledgeable and helpful and the equipment provided was in excellent condition, we would thoroughly recommend this for a day trip. More than satisfied. LetsRentOnline provided an excellent information pack, and the communication we had was always very prompt and with the information we needed. It was an added bonus to get some discount on the local attractions. Excellent local service and communication, Maria even bought us a traditional local cake on our arrival and made sure that everything was working correctly, again before we checked out to make sure everything was satisfactory. Overall a great level of service. 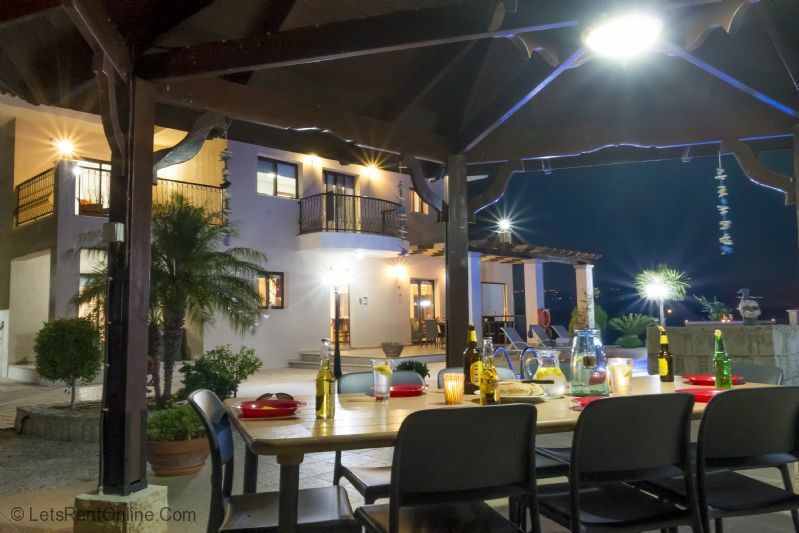 Villa Leni is situated in the heart of Argaka, a beautiful and somewhat unspoilt Cypriot Village sandwiched between the crystal clear waters of the Mediterranean Sea and some spectacular mountains filled with pine trees. 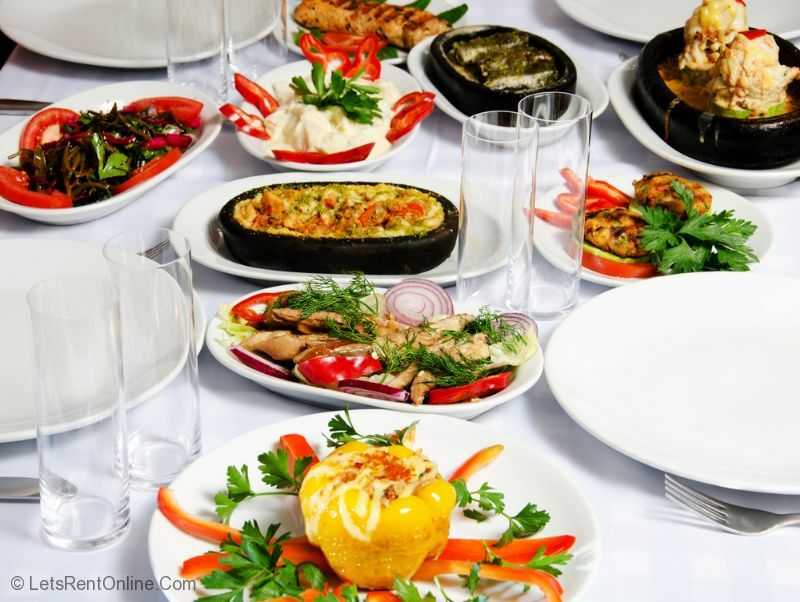 Argaka is home to a number of traditional Cypriot restaurants, a beach bar and an Irish Bar (please ask about their kids club facility) as well as a bakery and 2 mini-markets. 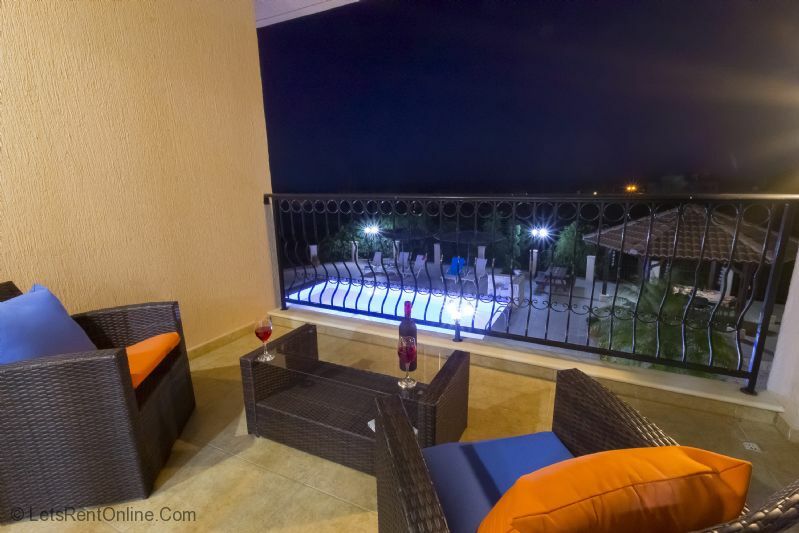 Many of these amenities are in walking distance of the villa or within a very short car journey. Travel a little way and you reach the bigger town of Polis. 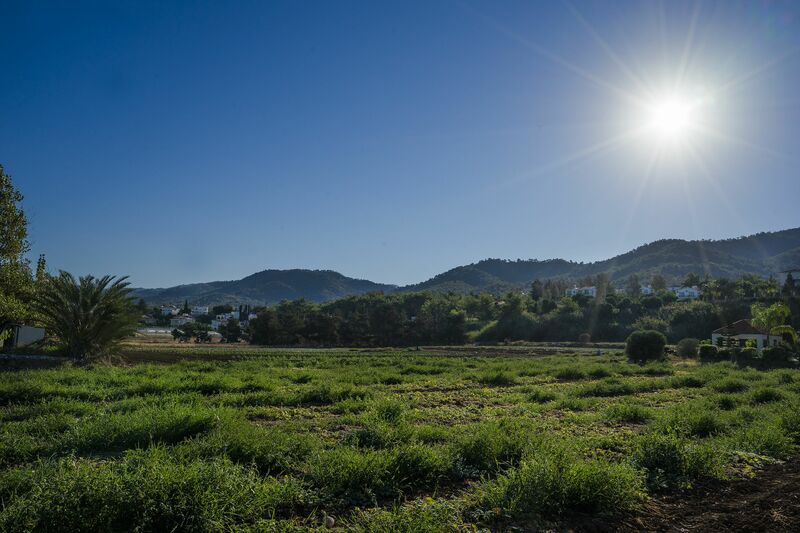 There is plenty of activity to choose from, whether you wish to dine in one of the many restaurants, shop at some larger supermarkets, hire mountain bikes, quad bikes or just watch the world go by in the ambience of the traditional village square. 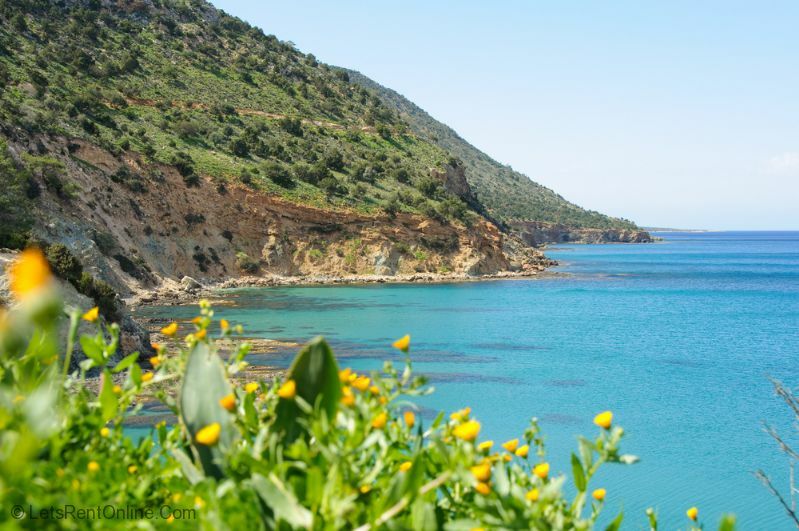 The nearby Latchi beach is renowned as one of the best on this side of the island and not as crowded as the beaches in and around Paphos itself (which can be reached by car in 30 minutes or under). 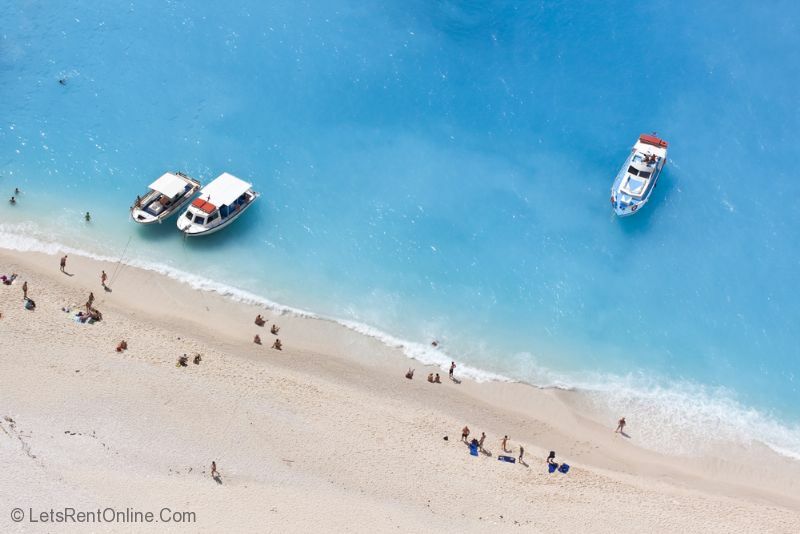 Latchi beach is famous for its clear blue sea, soft white sand and a great selection of watersports which are readily available. Take one of the boat rides (or even hire your own) to the ‘blue lagoon’, have a swim and/or snorkel, then come back to the pretty harbour/fishing port and have the famous ‘Fish Meze’ where you will be served approx 20 dishes including some of the freshest catches of the day whilst watching the world go by. 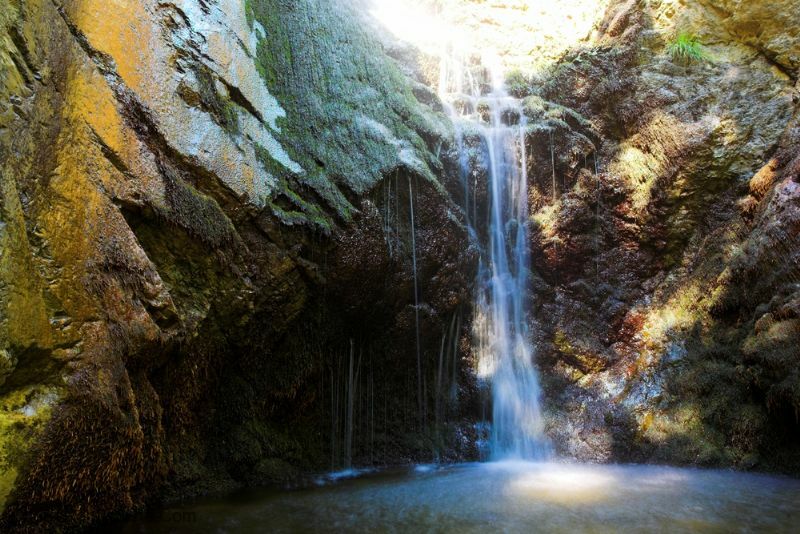 For the more adventurous, you can enter the ‘Akamas’ Nature reserve and go all the way round to ‘Lara Beach’ famous for its turtles and wonderful beach. 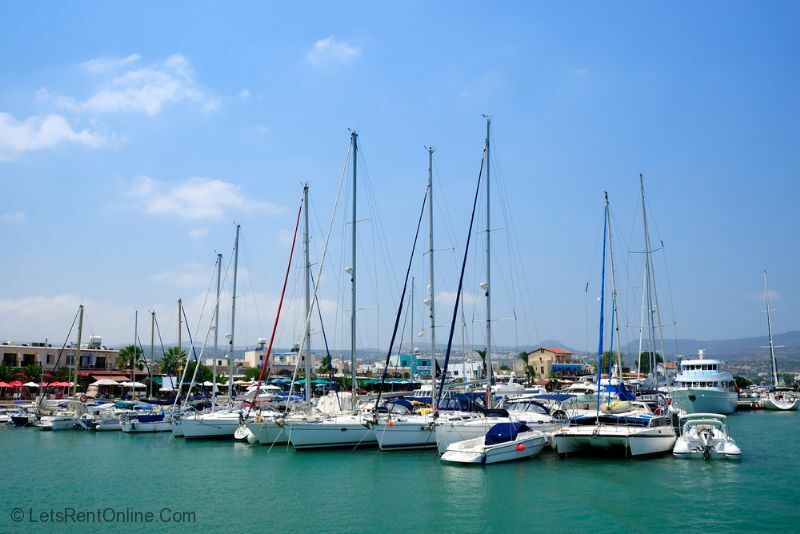 If it is unspoilt Cyprus you are looking for, this is a great area to visit. 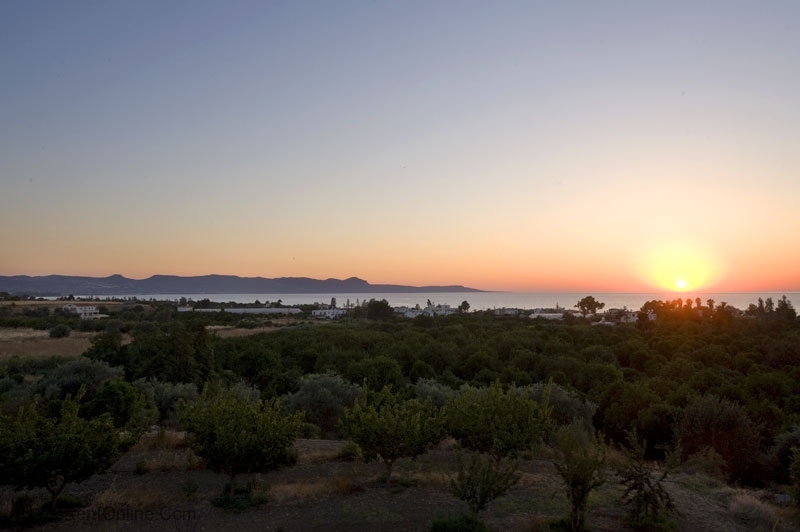 You may even venture into the nearby villages of Peristerona, Lysos and Miliou or further on to Kathikas (with its vineyards and wineries), Droushia and Panagia. 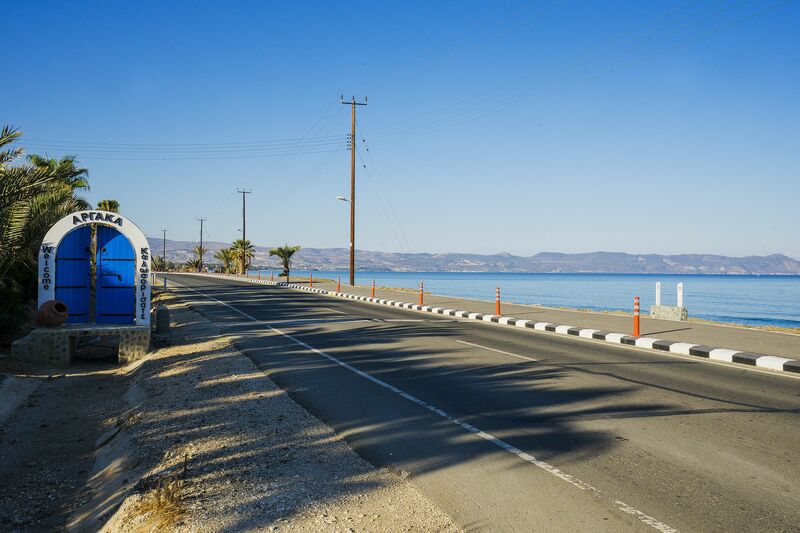 Other fantastic scenery can be taken in at Cedar Valley and the Troodos mountain range where in Winter, you can even Ski!Paphos airport is 1 hour away by very good quality roads with English road signs. Visit Argaka and you won’t be disappointed. 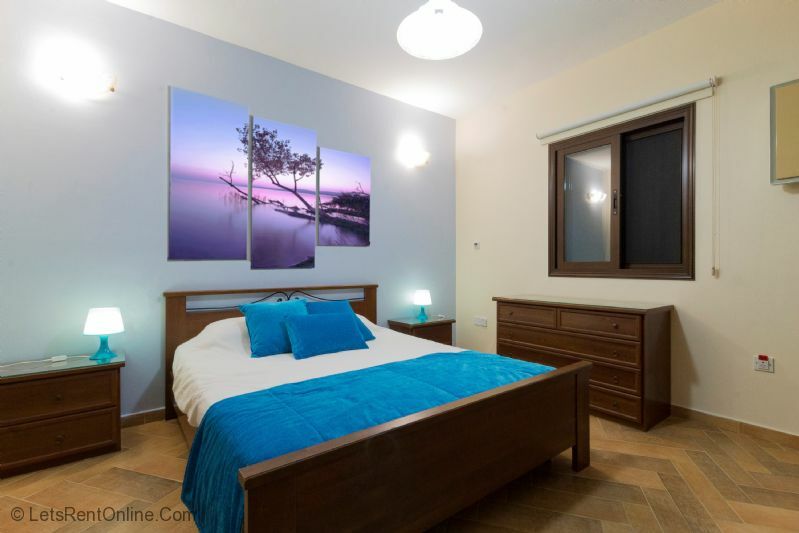 Air-Conditioning is included in the bedrooms. 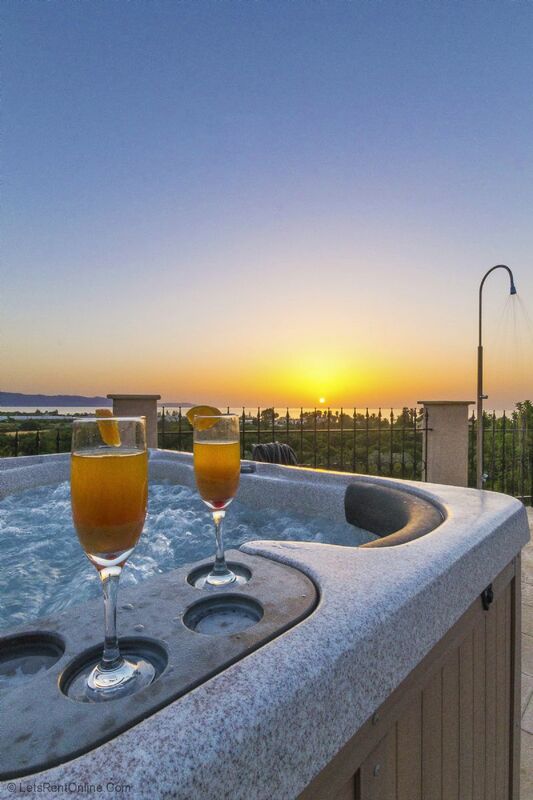 Minimum Order Period of 7 Nights on all Extras (3 days for hot tub). 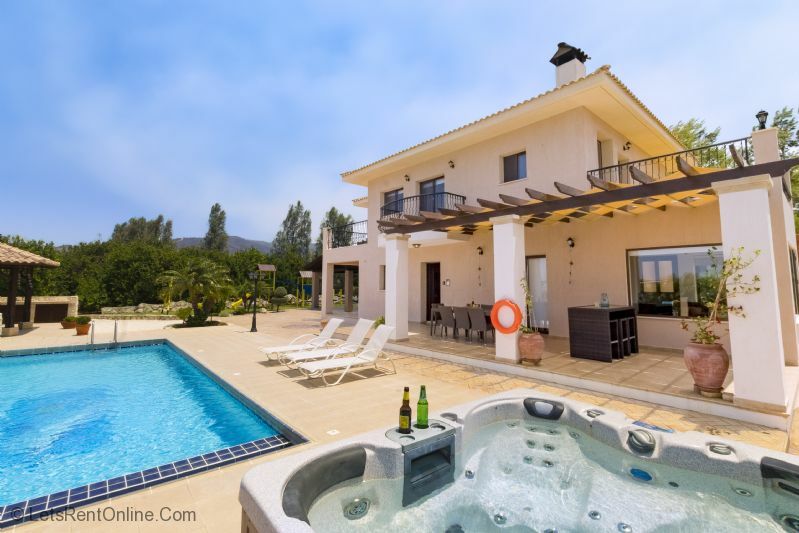 30% deposit required, with the balance paid 56 days prior to arrival. 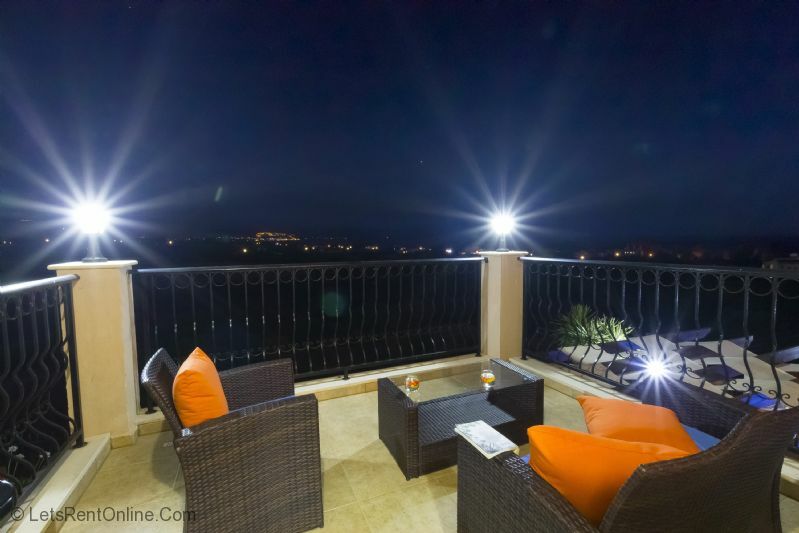 Access to the property is anytime from 4pm on day of arrival. 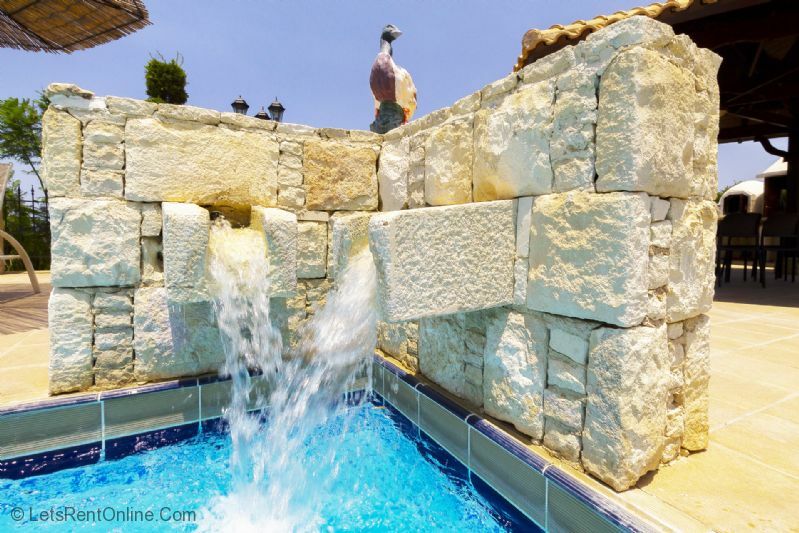 Guests must vacate villa by 11am on day of departure.